This group of paperweights is a representative sample of the Chinese Paperweights made in the late 1920s and throughout the 1930s as an attempt to duplicate 19th Century antique weights made in the United States and France. Because they are almost 100 years old, they are very collectible. Every collector should own a few of these as study pieces. 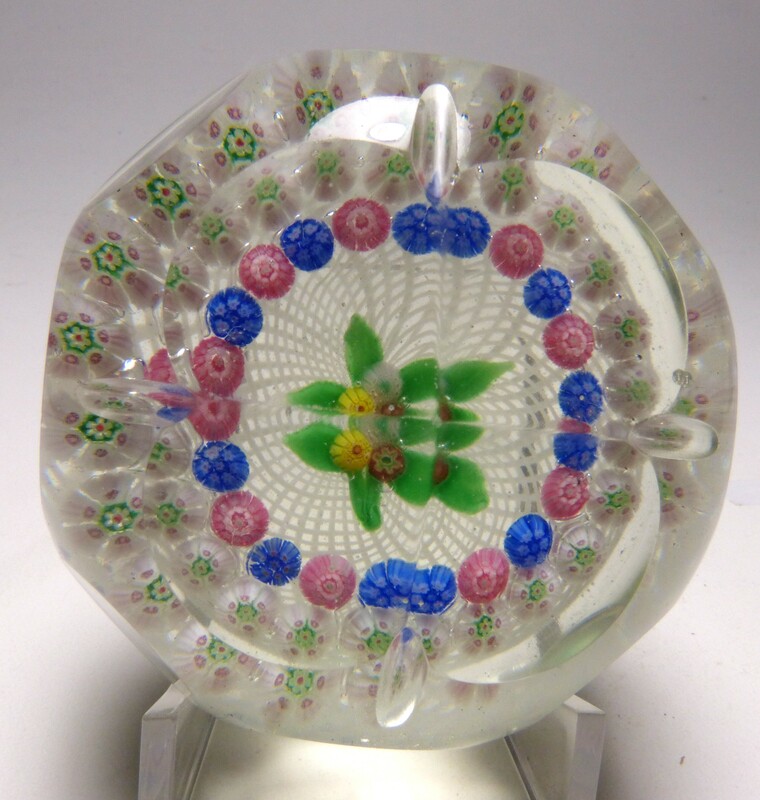 I have also included some other Chinese paperweights that are newer or uniquely Chinese. 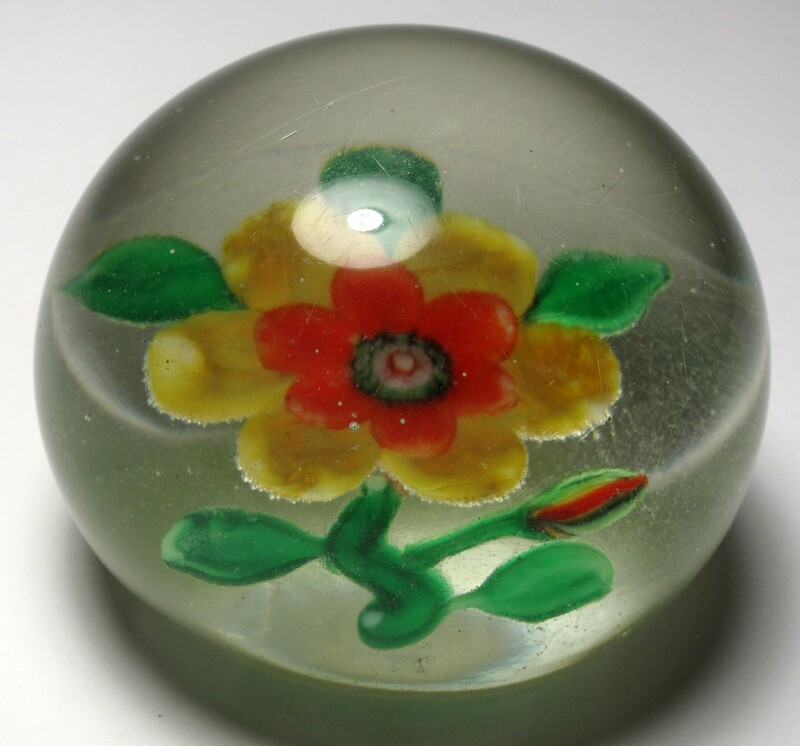 The history of the early Chinese paperweights is mostly anecdotal as no written records have been discovered. 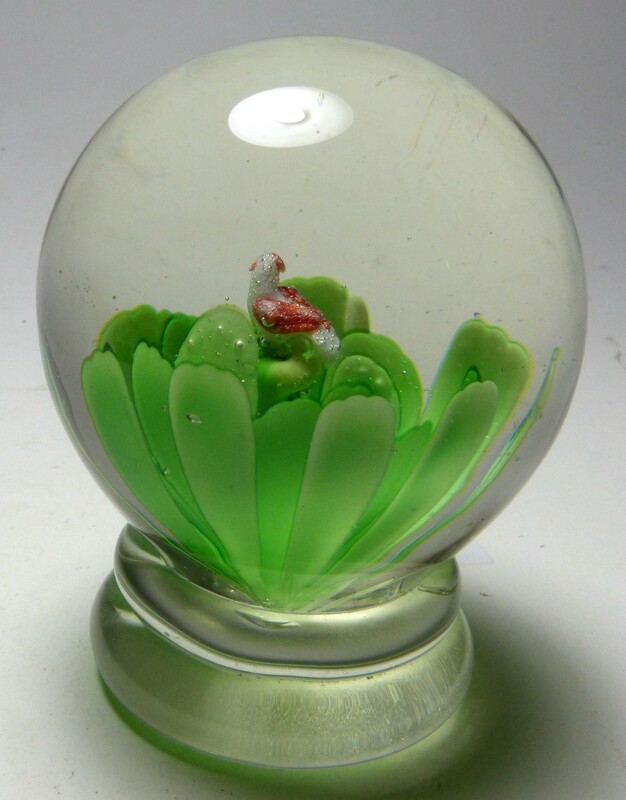 The story is that an American dealer sent examples of paperweights made by the New England Glass Company (NEGC), Boston & Sandwich Glass Company (B&S), Millville makers, and French factories to a Chinese factory and requested copies be made. The results are interesting and sometimes confused with the originals by inexperienced collectors. The earliest pictures of these paperweights appeared in the book American Glass Paperweights by Francis Edgar Smith published in 1939. Smith was aware that at least one of the paperweights shown in his book was Chinese. Since Smith was not an expert collector, this indicates that there was some general knowledge that these were Chinese prior to 1939. In the United States, the Tariff Act of 1930 required that every imported item must be conspicuously and indelibly marked in English with its country of origin. 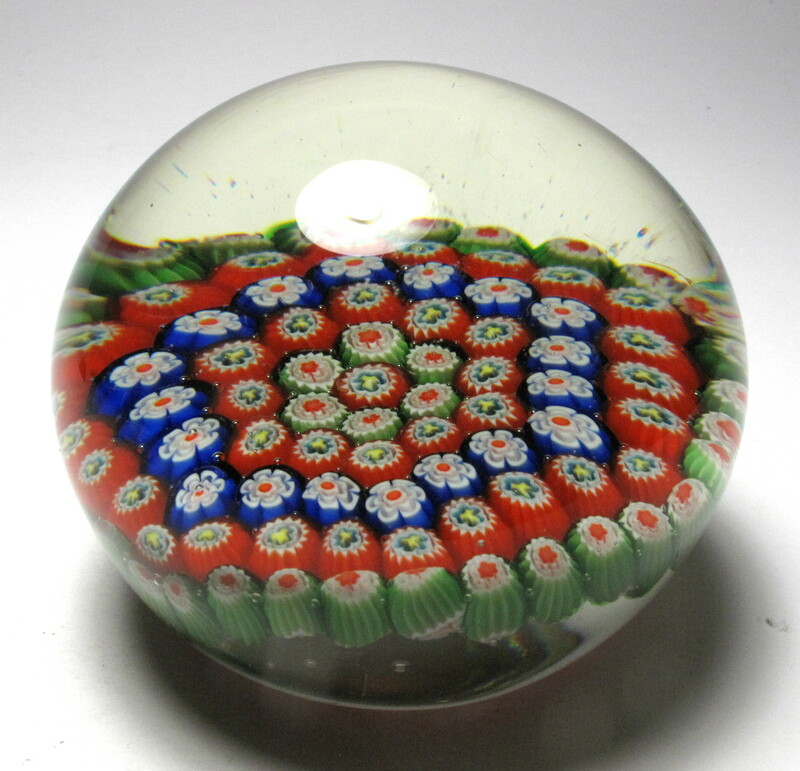 As a result, many of these Chinese paperweights are scratch signed on the bottom "CHINA". Many are also not signed, suggesting that either they were imported prior to 1930 or the importer ignored the requirement. 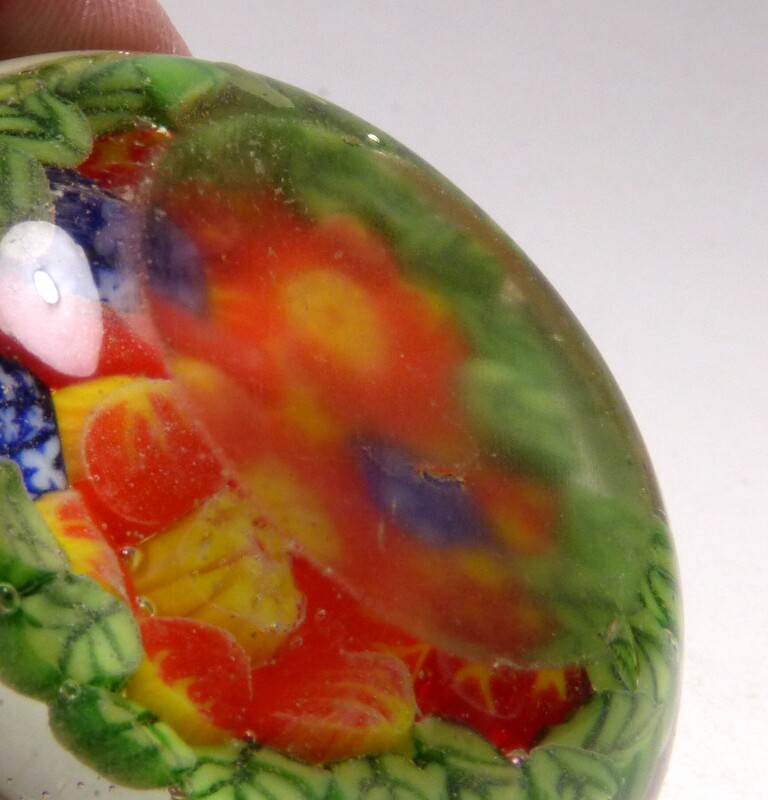 Most likely the earliest Chinese paperweights were made prior to 1930. 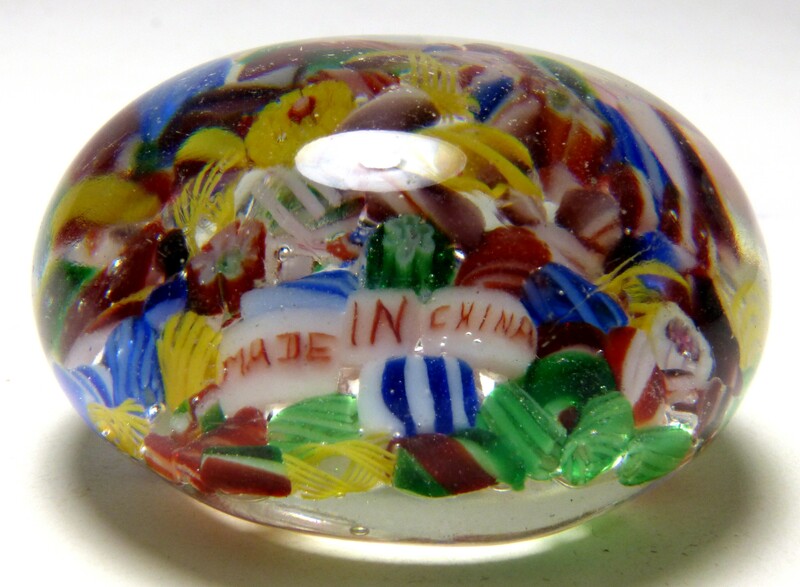 The Chinese makers often combined design features found in paperweights from different makers. 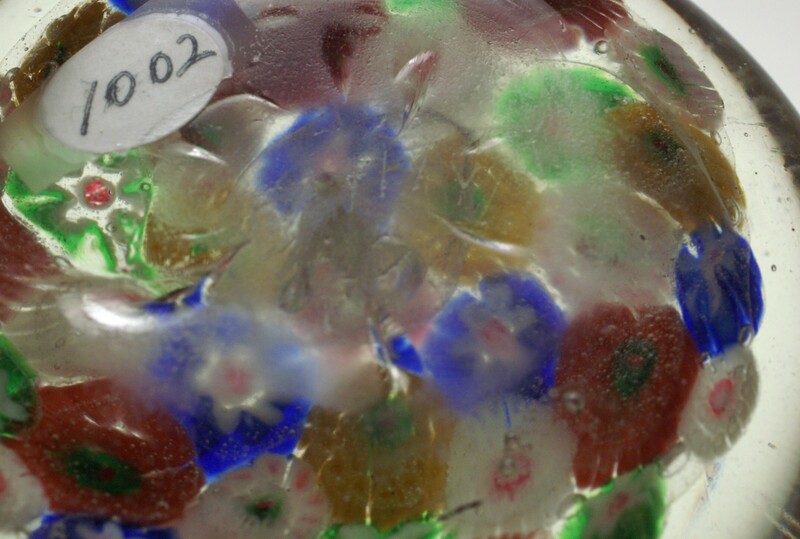 For example they copied the latticinio grounds used by New England Glass Company and used them with copies of Baccarat Pansy weights. 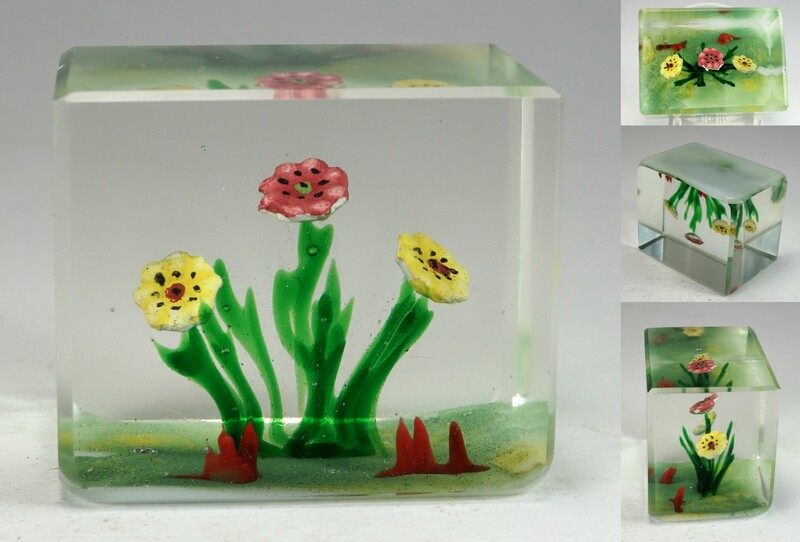 The original Baccarat pansy paperweights never had a latticinio ground. They copied the pedestal rose from Millville and then used the pedestal bottom with other weights. It is fun to collect all the variations. Most have a light weight glass mixture that is high in soda and has a greenish tinge. The glass also has a soft almost oily feel. Frequently they have bubbles or debris in the glass. And because of their age, many of these have minor scratches or other surface defects. 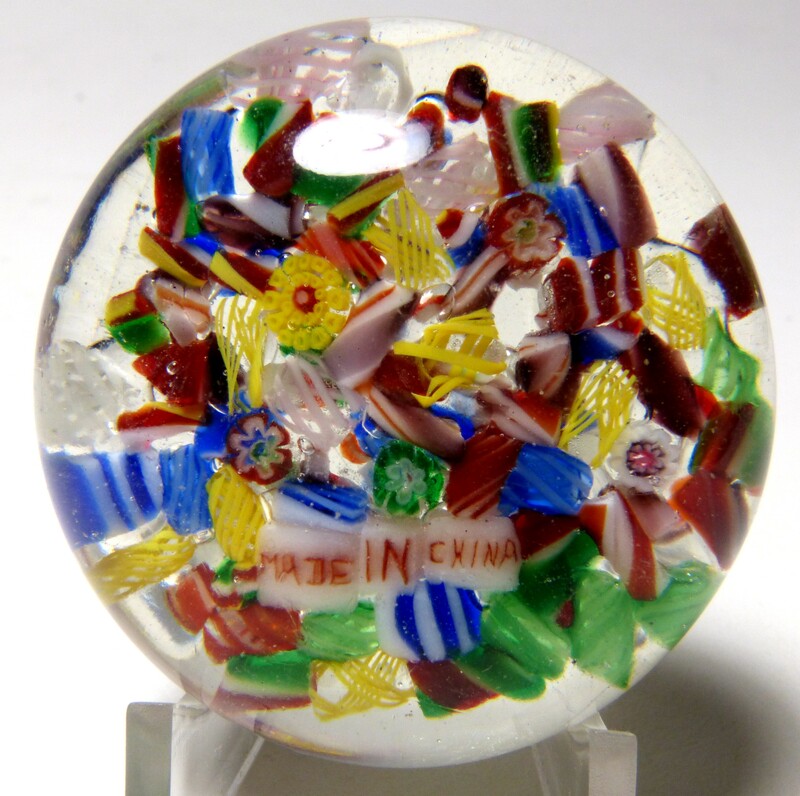 For more information on Chinese paperweights, there is a great chapter on Chinese paperweights in the book World Paperweights: Millefiori and Lampwork by Robert Hall. The book includes a price guide. For this and other great references on paperweights, check out my list of paperweight books for sale. 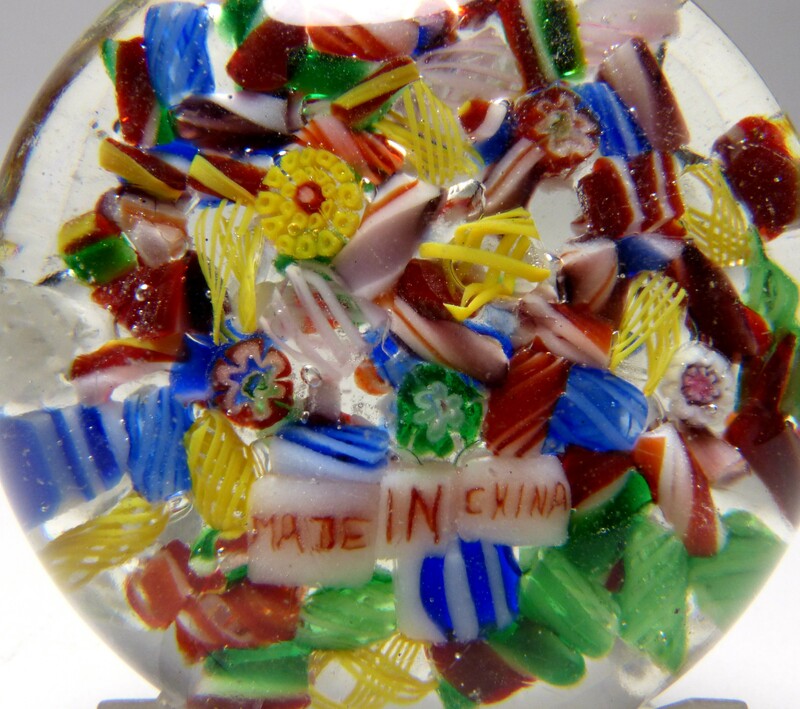 2497 Rare Chinese Scramble Paperweight with "MADE IN CHINA" Signature Canes. circa 1930. A humorous addition from China. Since this style was intended to be a copy of a French scramble or end of day weight from 1845-1860 (probably St. Louis or Clichy), it leaves you wondering why they chose to add the "MADE IN CHINA" canes at the bottom. Perhaps it was a response to the US customs requirement that goods be marked with the country of origin in English starting about 1930. Some importers complied by scratch signing the word CHINA on the bottom. In any event, this is a rare and welcome addition to any collection of Chinese paperweights. 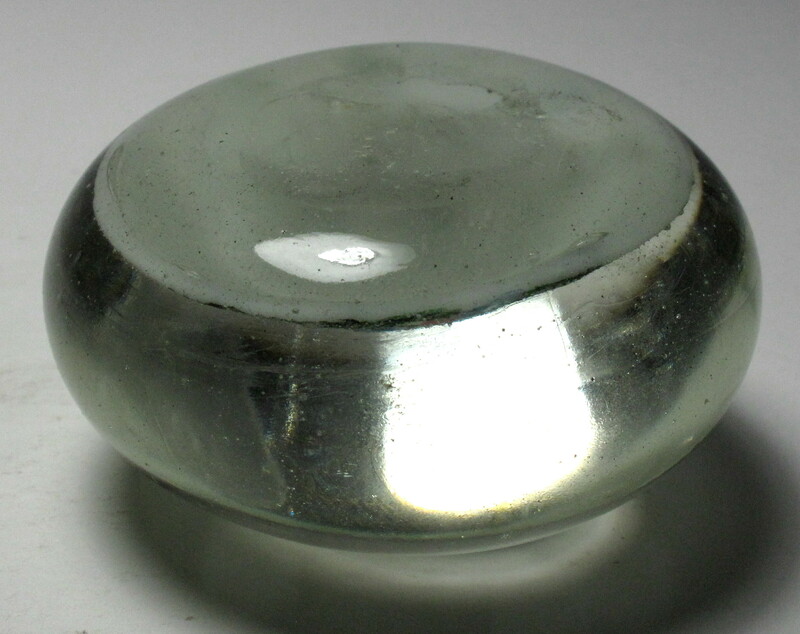 As with most Chinese paperweights, this paperweight has a light weight glass mixture that is high in soda and has a greenish tinge. The glass has a soft oily feel. There are bubbles or debris in the glass. Special thanks to another collector who pointed out that the words are actually word canes rather than painted plaques. The lettering goes all the way through the white background from top to bottom. You can see the letters in reverse from the bottom. This is in contrast to a painted plaque where the letters would be visible on only the top surface. 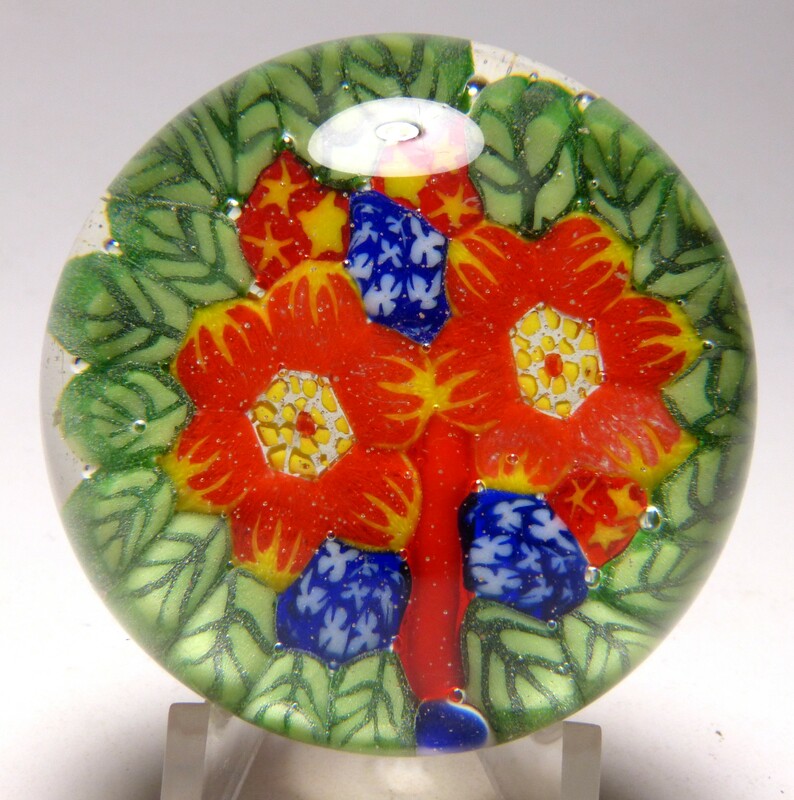 Chinese Paperweights were made in the late 1920s and throughout the 1930s as an attempt to duplicate 19th Century antique weights made in the United States and France. Because they are almost 100 years old, they are very collectible and every collector should own a few of these as study pieces. 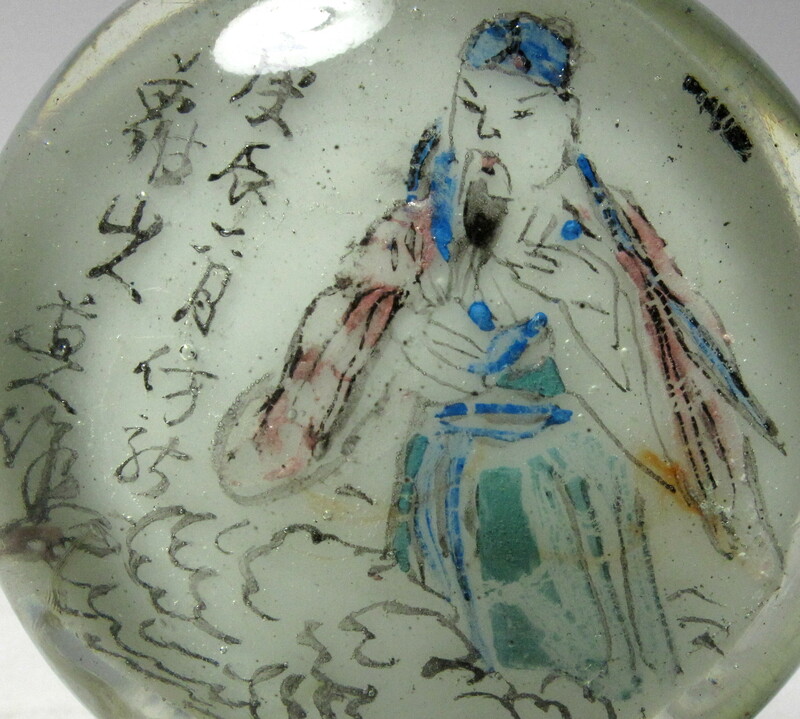 The history of the early Chinese paperweights is mostly anecdotal as no written records have been discovered. 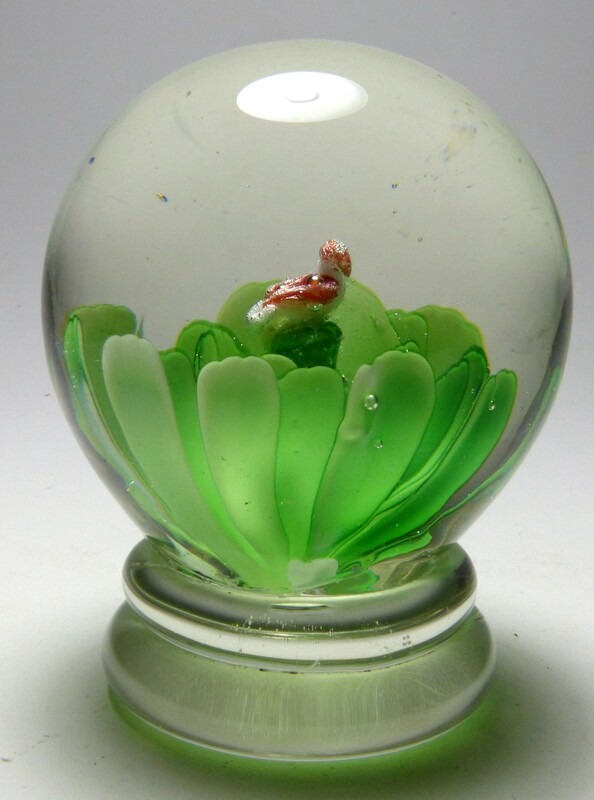 The story is that an American dealer sent examples of paperweights made by the New England Glass Company (NEGC), Boston & Sandwich Glass Company (B&S), Millville makers, and French factories to a Chinese factory and requested copies be made. The results are interesting and sometimes confused with the originals by inexperienced collectors. The earliest pictures of these paperweights appeared in the book American Glass Paperweights by Francis Edgar Smith published in 1939. Smith was aware that at least one of the paperweights shown in his book was Chinese. Since Smith was not an expert collector, this indicates that there was some general knowledge that these were Chinese prior to 1939. 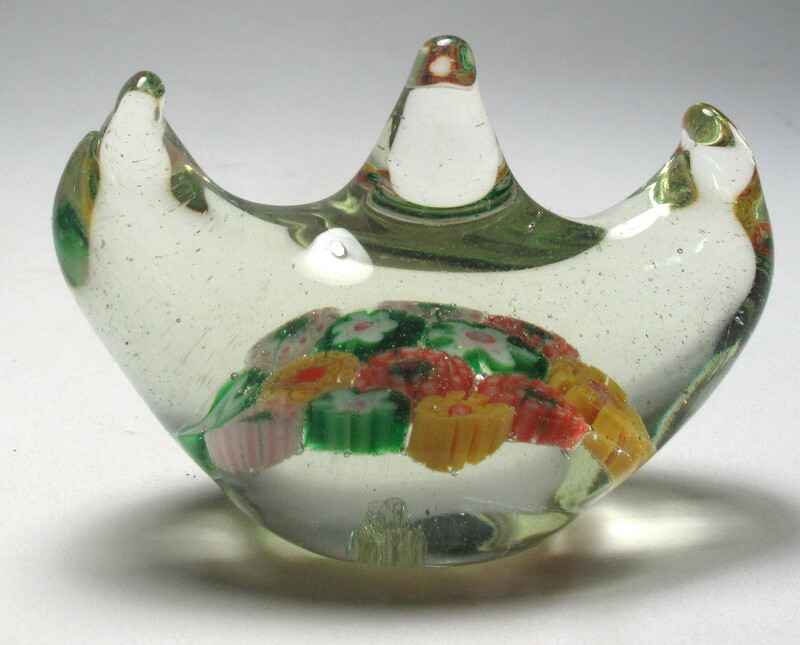 In general, Chinese paperweights from this period have a light weight glass mixture that is high in soda and has a greenish tinge. The glass also has a soft almost oily feel. Frequently they have bubbles or debris in the glass. And because of their age, many of these have minor scratches or other surface defects. Small Size: 2 1/8” diameter by 1 3/16" high. Signature: Signed "MADE IN CHINA" on three white signature canes in the design. 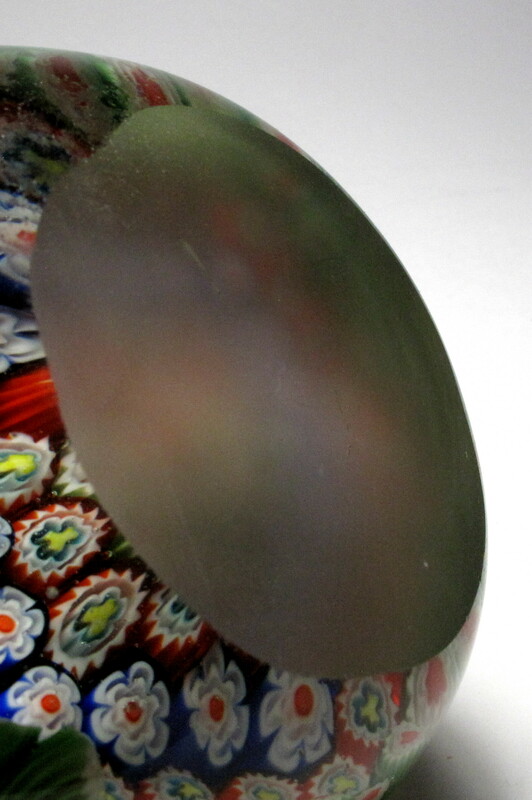 Condition: Good condition typical of Chinese paperweights from this period. Some light scratches and small nicks. No cracks. The glass has a soft oily feel. There are bubbles and debris in the glass. 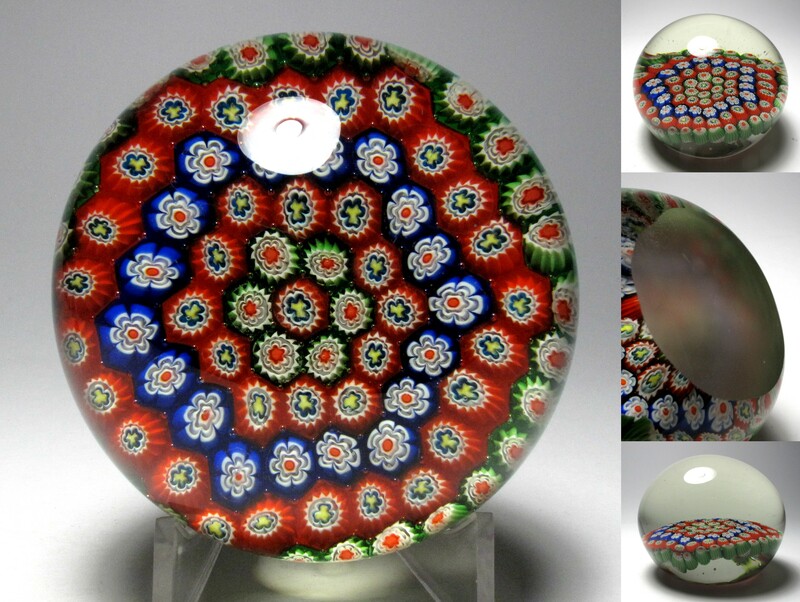 4450 Huge Magnum Modern Chinese Concentric Hexagon Millefiori Paperweight. circa 1970-1990. 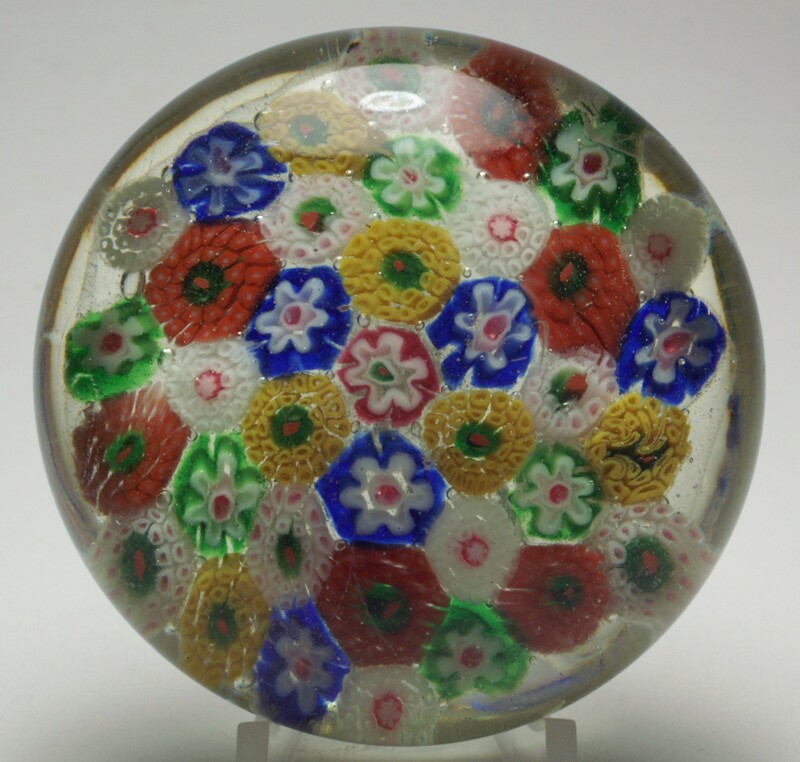 Huge Chinese millefiori paperweight with a concentric hexagon pattern. There are five hexagon shapes and a single cane in the center. 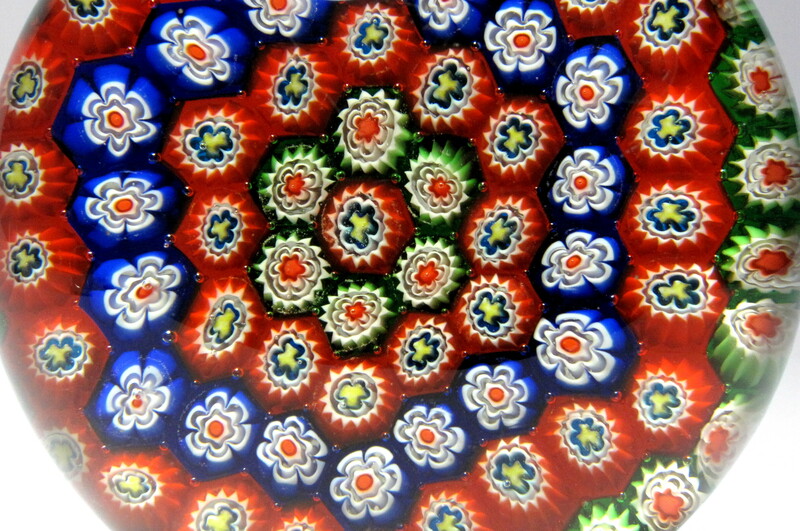 This pattern may be inspired by Clichy paperweights with a hexagon pattern. 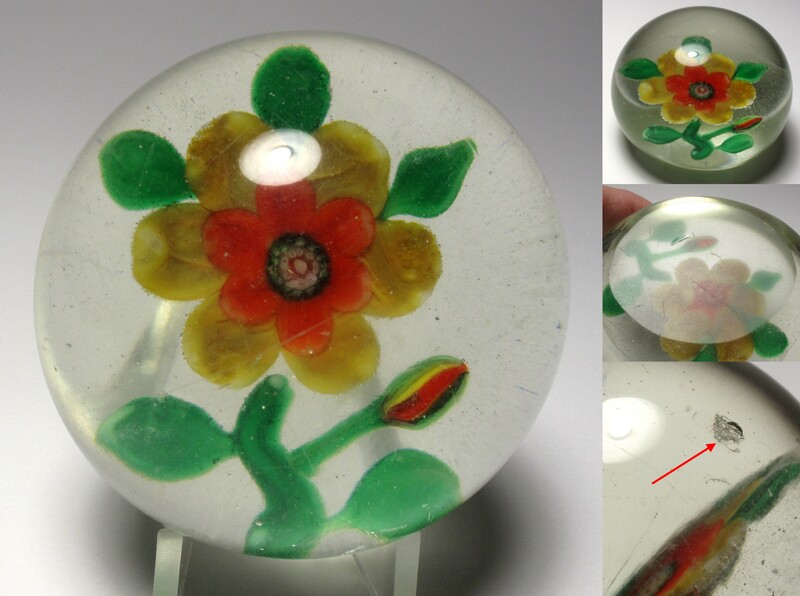 As is typical of Chinese paperweights from this period, the base is ground matte and is not a perfect circle. I believe this dates from 1970 to 1990. It has bright, gaudy colors and is unusually large (just under 4" diameter). In the United States, the Tariff Act of 1930 required that every imported item must be conspicuously and indelibly marked in English with its country of origin. 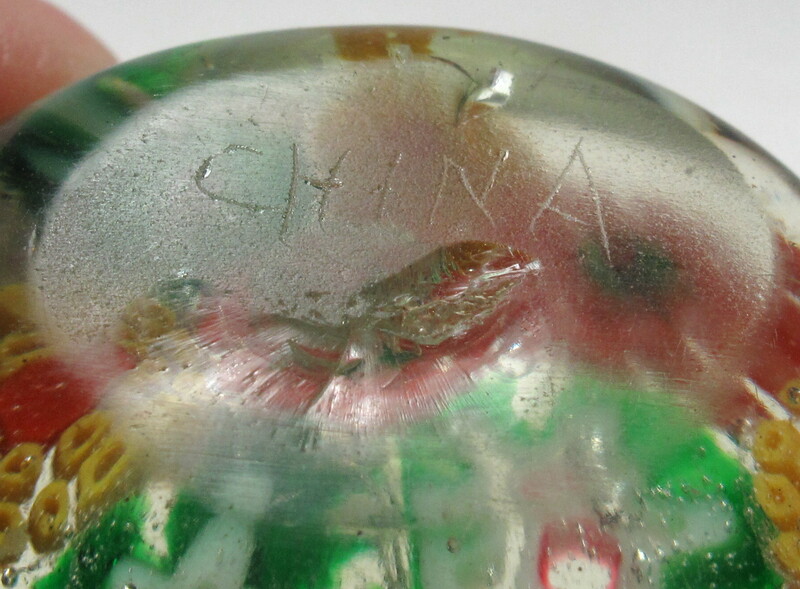 As a result, many of these Chinese paperweights are scratch signed on the bottom "CHINA". Many are also not signed, suggesting that either they were imported prior to 1930 or the importer ignored the requirement. 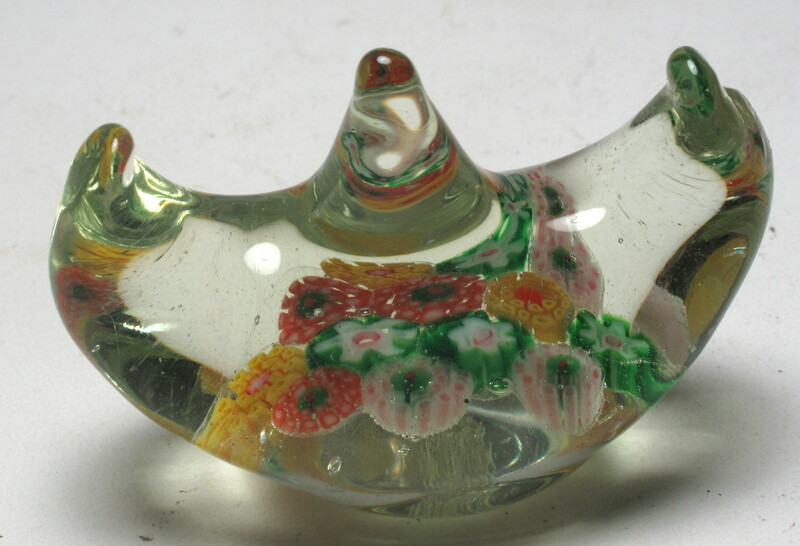 Most likely the earliest Chinese paperweights were made prior to 1930. Early imports from China have a light weight glass mixture that is high in soda and has a greenish tinge. The glass also has a soft almost oily feel. Frequently they have bubbles or debris in the glass. More recent imports are of improved quality and have better glass and execution. Huge Size: 3 15/16" (just under 4") diameter by 3 1/8" high. The base is ground flat with a matte finish. 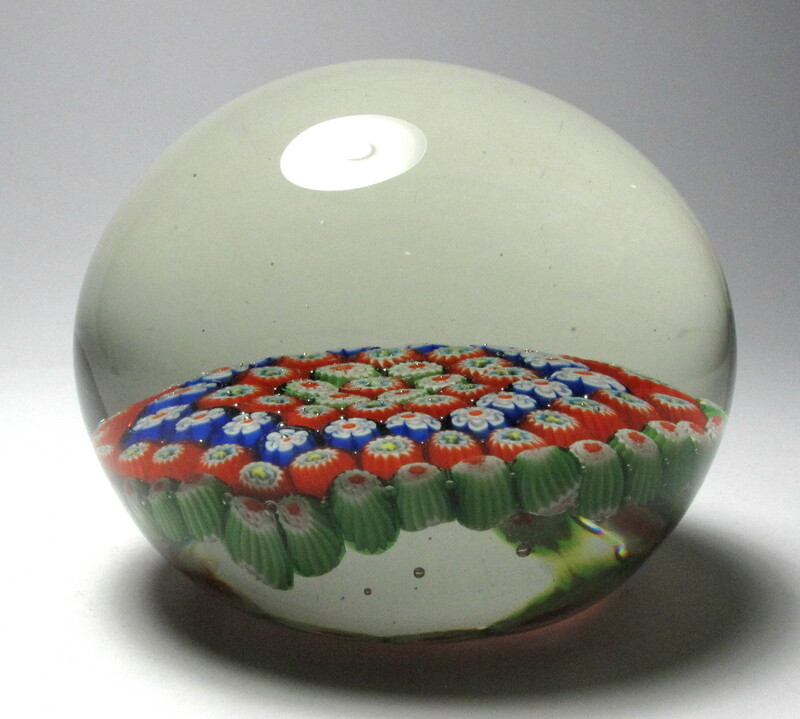 As is typical of modern Chinese paperweights, the base is not a perfect circle. It weighs 2 pounds 6 ounces. Signature: Unsigned but I guarantee that this is from China 1970 or later. Condition: Excellent condition with no chips or cracks or scratches found on inspection. 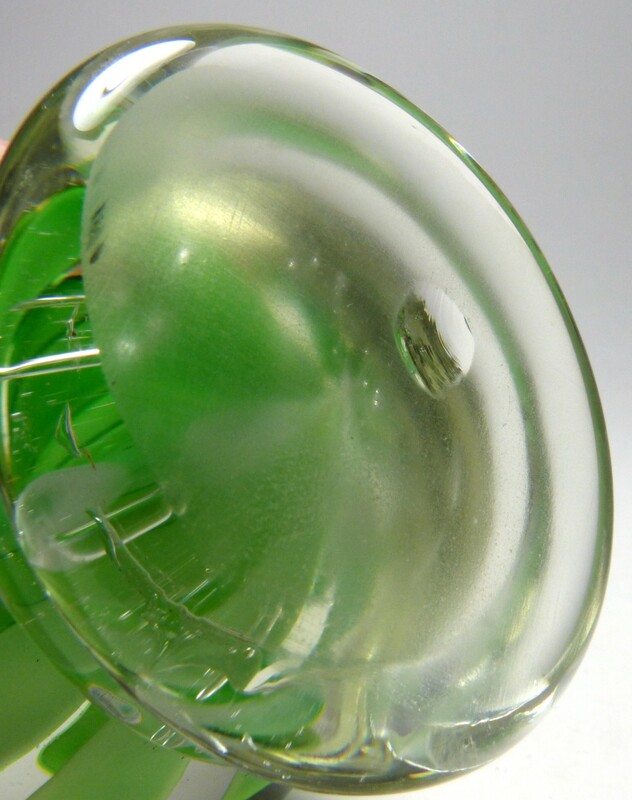 The glass has a slight green tinge (as shown in the pictures). 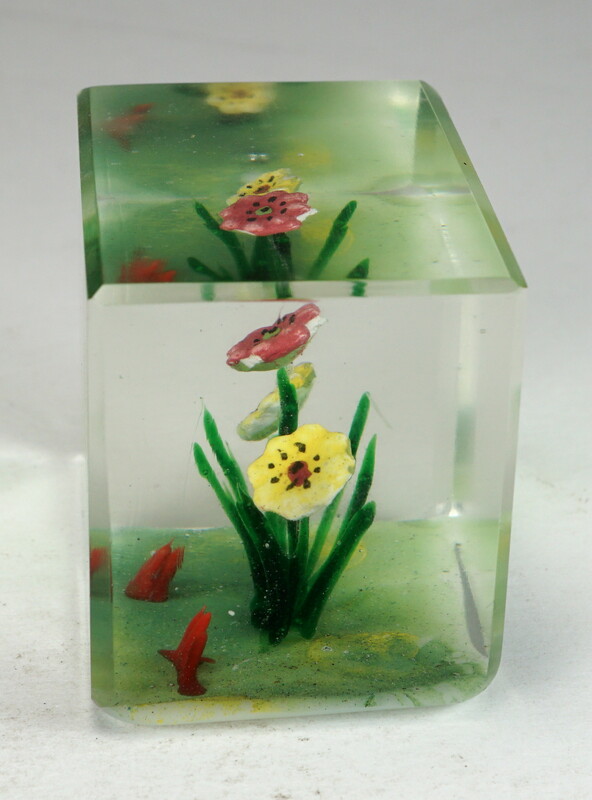 2400 Chinese Aquarium Paperweight with Three Flowers. This is a Chinese invention. 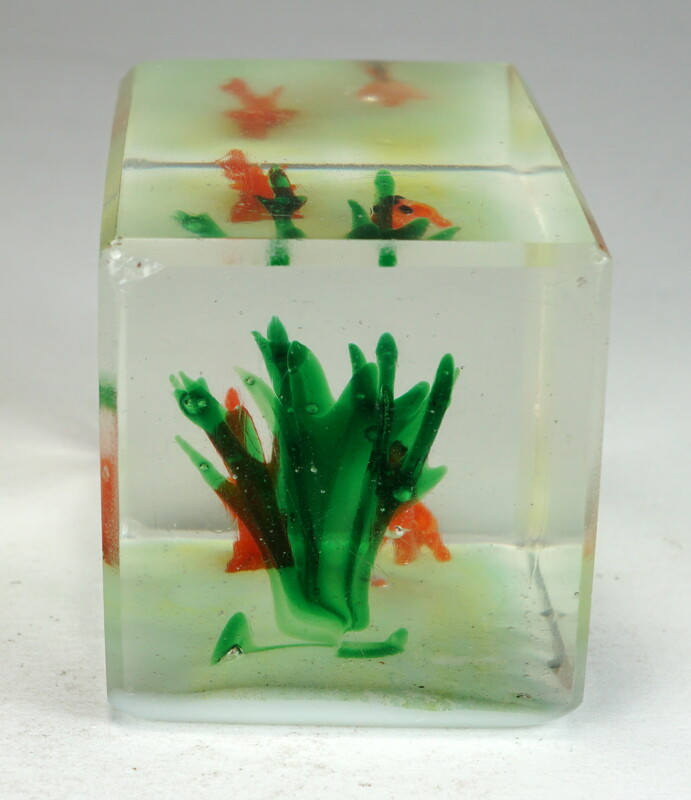 It is intended to be placed in an aquarium along with the rocks and plants. 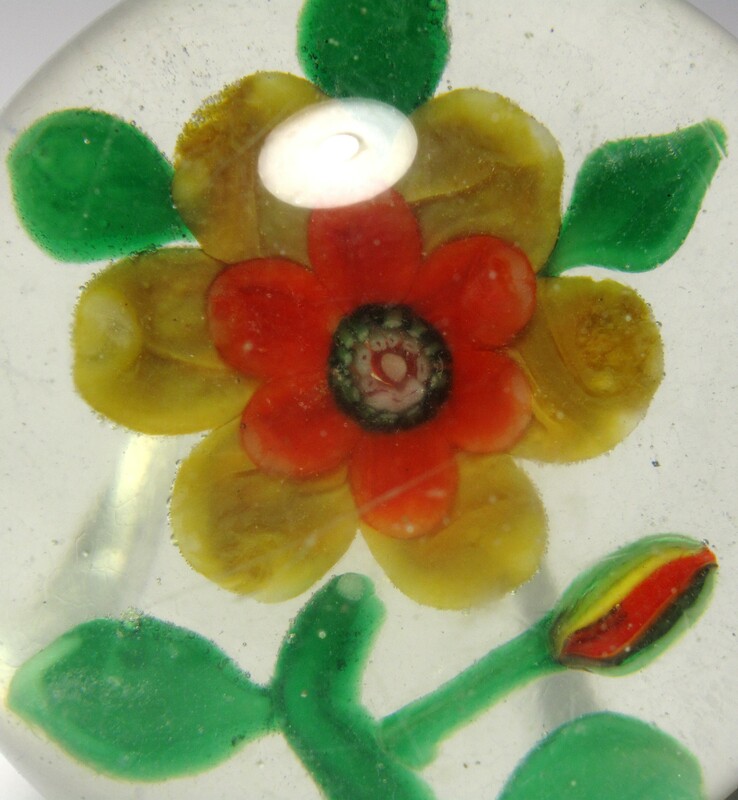 The paperweight features three flowers, two yellow and one pink, along with other green and red foliage. The composition is placed on a white base and is encased in a rectangular block of glass. The edges of the block are beveled. Novelty items like this started appearing in the US in the 1930s and some were sold at the 1939 World's Fair, but I believe this one may be more recent. A fun collectible. 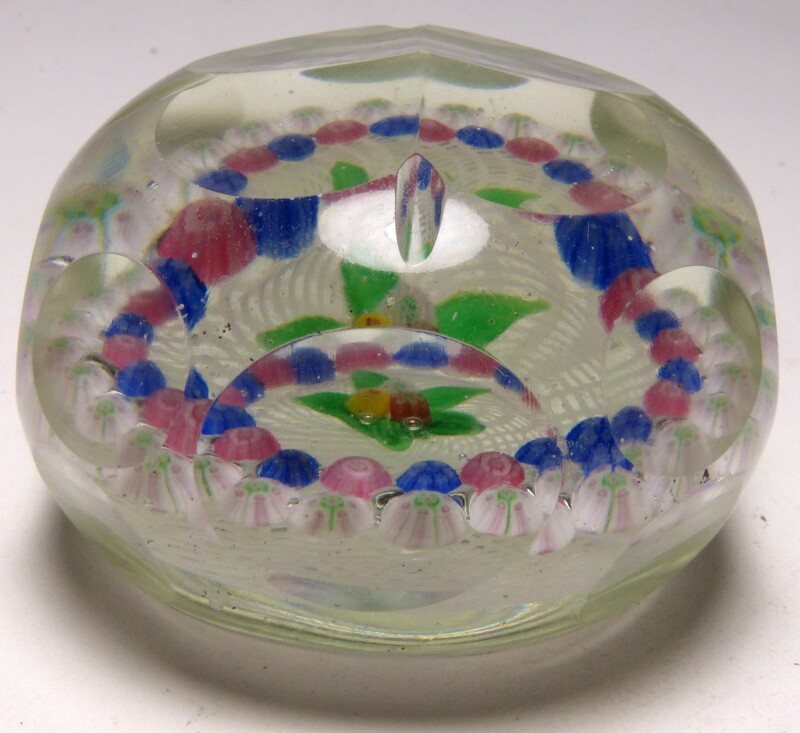 Chinese Paperweights were made in the late 1920s and throughout the 1930s as an attempt to duplicate 19th Century antique weights made in the United States and France. Because they are almost 100 years old, they are very collectible and every collector should own a few of these as study pieces. 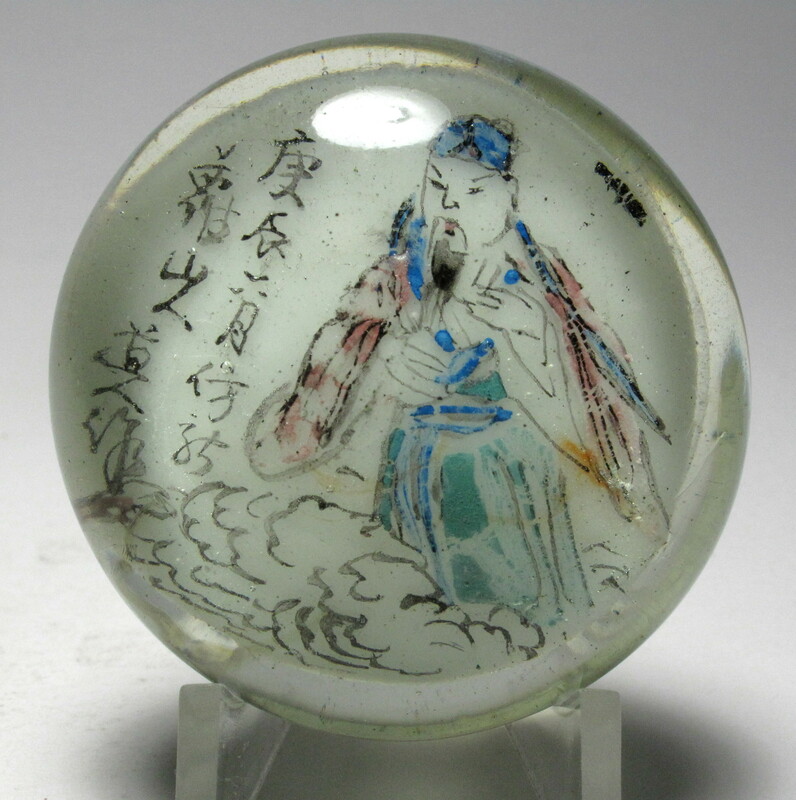 The history of the early Chinese paperweights is mostly anecdotal as no written records have been discovered. 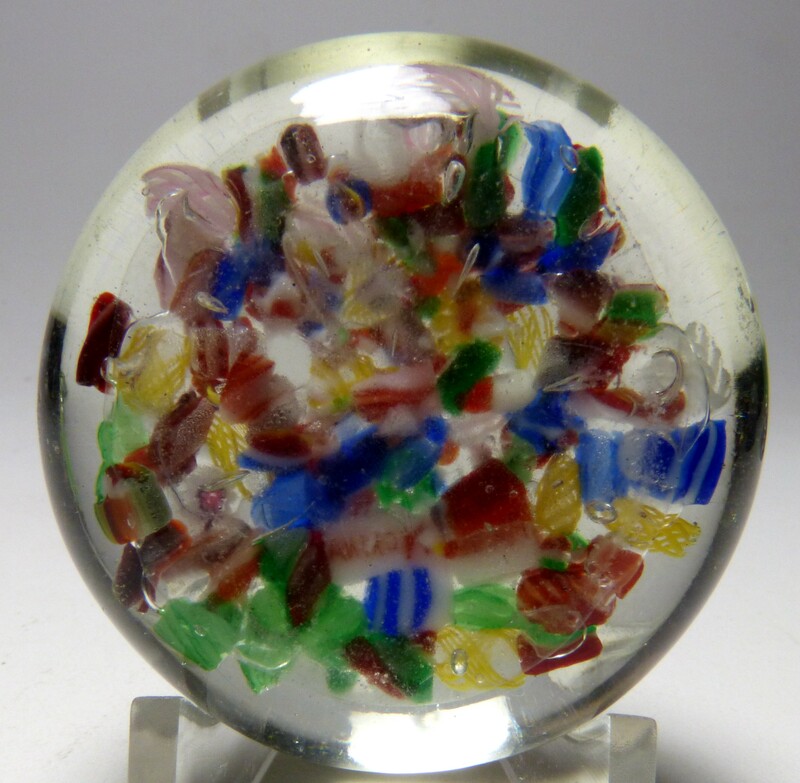 The story is that an American dealer sent examples of paperweights made by the New England Glass Company (NEGC), Boston &Sandwich Glass Company (B&S), Millville makers, and French factories to a Chinese factory and requested copies be made. The results are interesting and sometimes confused with the originals by inexperienced collectors. The earliest pictures of these paperweights appeared in the book American Glass Paperweights by Francis Edgar Smith published in 1939. Smith was aware that at least one of the paperweights shown in his book was Chinese. Since Smith was not an expert collector, this indicates that there was some general knowledge that these were Chinese prior to 1939. 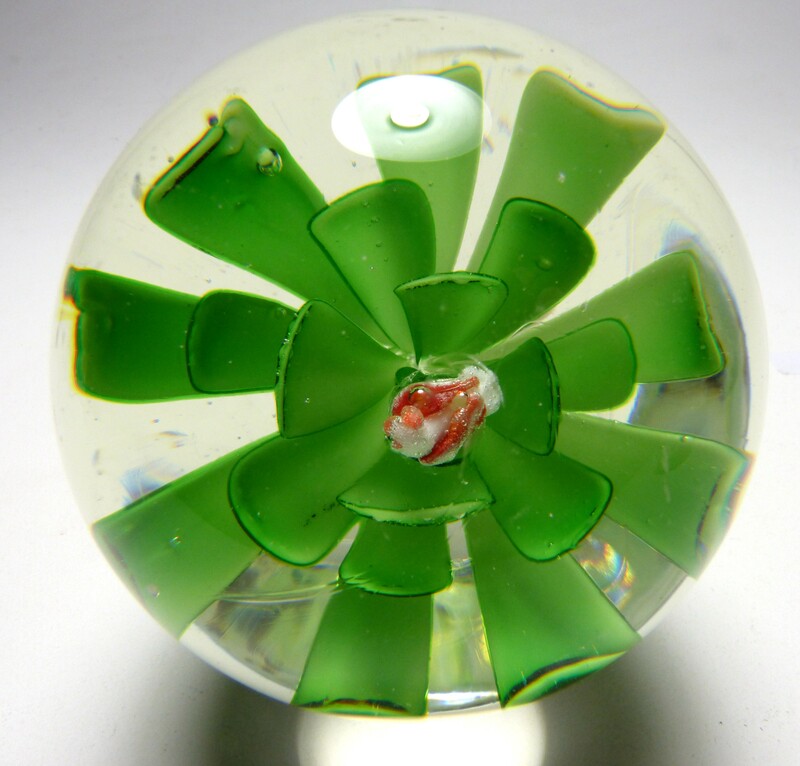 In general, Chinese paperweights from the 1930s have a light weight glass mixture that is high in soda and has a greenish tinge. The glass also has a soft almost oily feel. Frequently they have bubbles or debris in the glass. And because of their age, many of these have minor scratches or other surface defects. 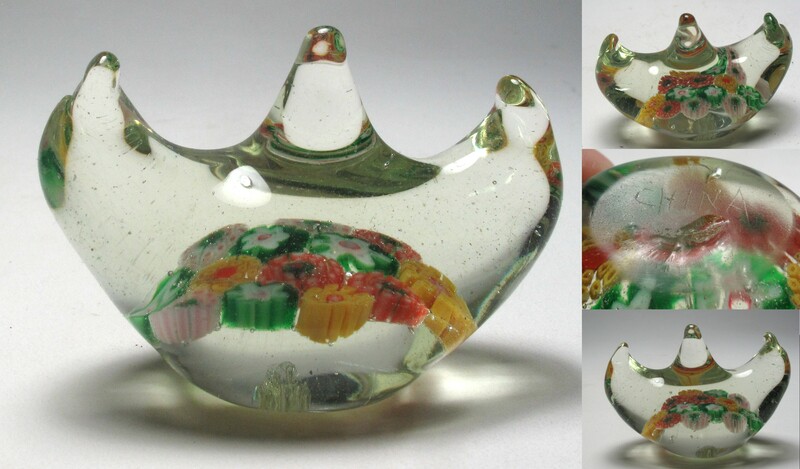 Chinese paperweights made in the 1970s and later usually have better quality glass and are free of debris. Size: 1 15/16” long by 1 3/8" deep by 1 5/8" high. Signature: Unsigned, but I guarantee this is a Chinese paperweight, made in the 1930s or later. Condition: Very good condition with only a few minor scratches and no cracks or chips. The glass appears to be good quality but has a slight green tinge. 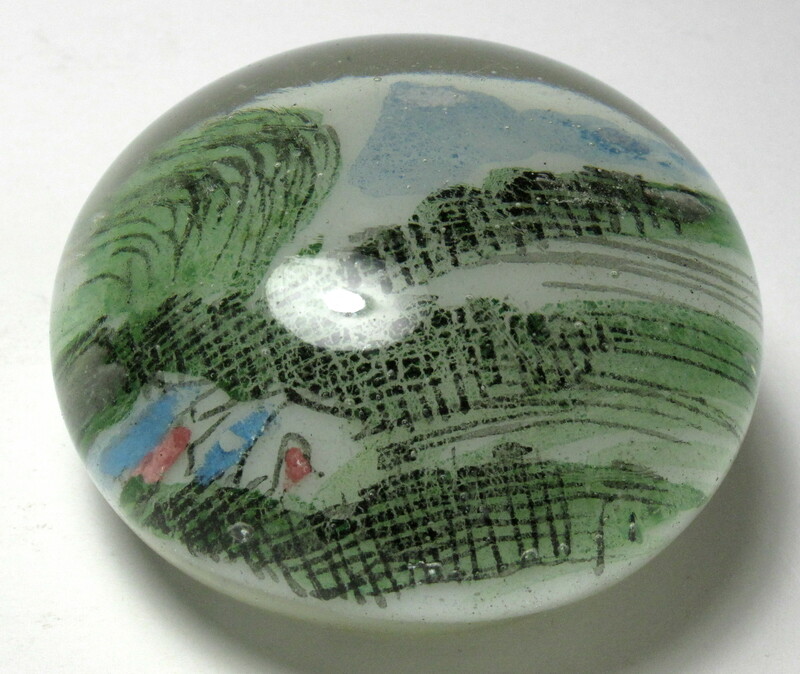 3698 Rare Chinese White Paperweight with Landscape Painting with Mountain and House. Circa 1930. 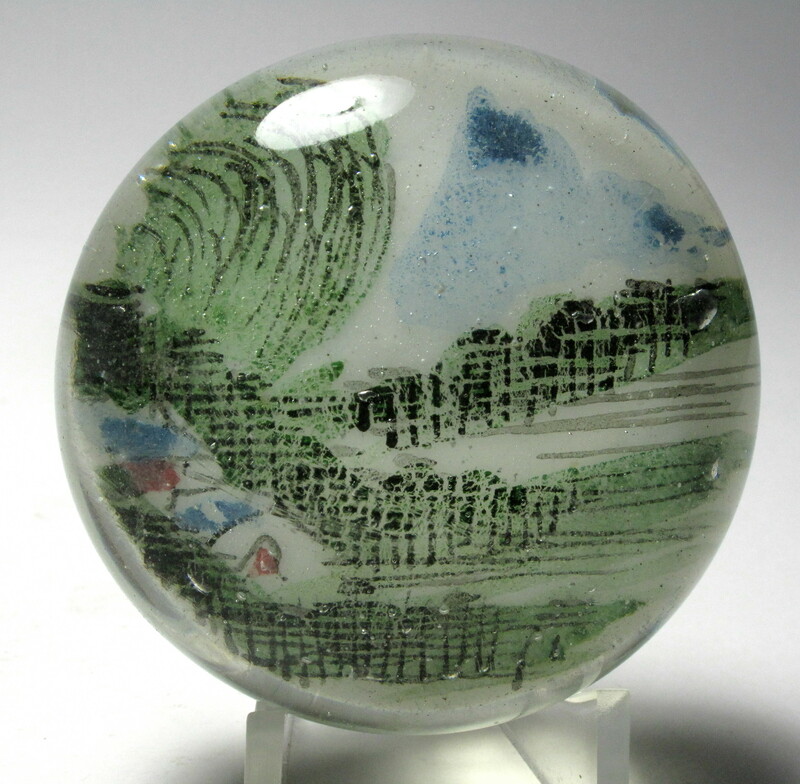 This paperweight has a colored painting of a Chinese landscape with snow peaked mountain in the distance and a house and another building on the left side. Elsewhere there is lush foliage and trees. The painting is created on a white enamel base and then encased in glass. The style dates from the 1930s and is almost an antique. 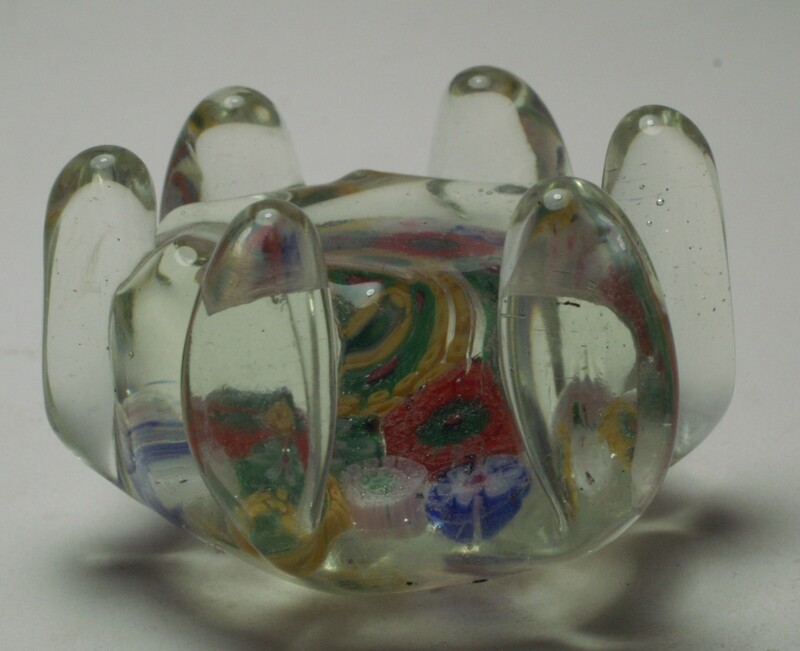 This paperweight is a form of Chinese folk art although it was most likely inspired by frit weights from Southern New Jersey. I believe the Chinese were given examples of Millville frit weights to duplicate. 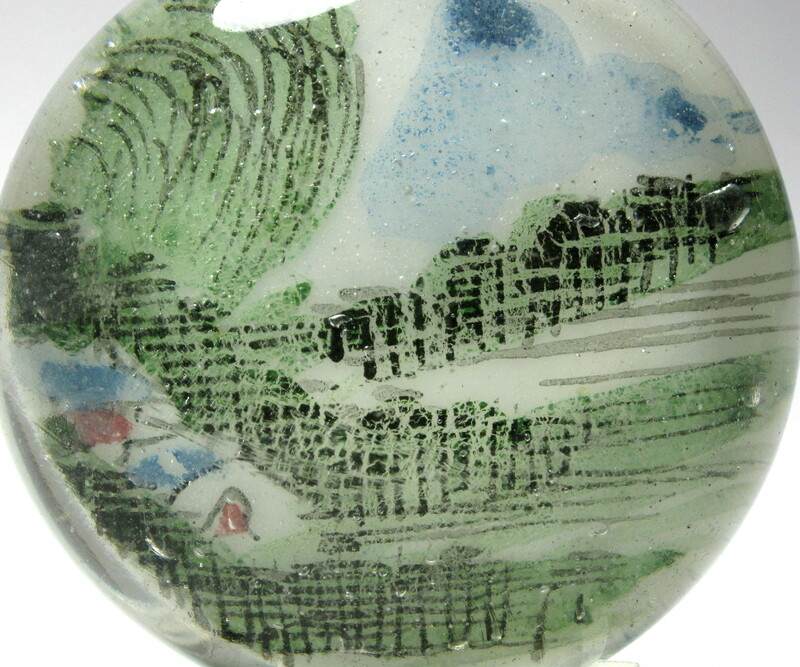 Since they were already experienced in painting on ceramics, they applied their own unique interpretation to paperweights using a white enamel disk as the base and incorporating familiar themes already found in Chinese art. Medium Size: 2 9/16" diameter by just under 1 1/2" high. The bottom is fire finished. Signature: Unsigned but I guarantee that this paperweight is from China and dates from about 1930. Condition: Very good condition. The surface has a few indentations, but is mostly smooth. No chips or cracks. There is some debris in the glass. 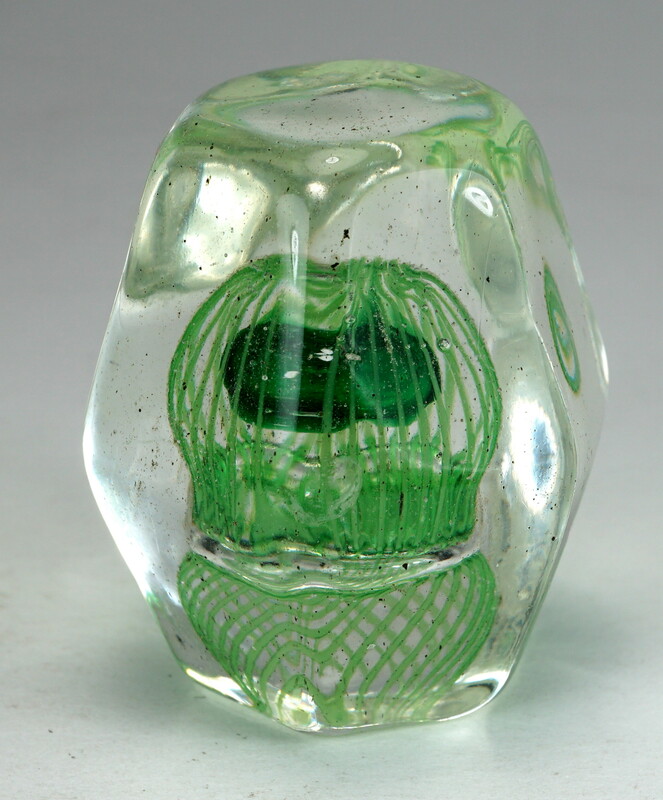 As with Chinese paperweights from this period, this paperweight has a light weight glass mixture that is high in soda and has a greenish tinge. The glass has a soft almost oily feel. There are tiny bubbles in the glass. 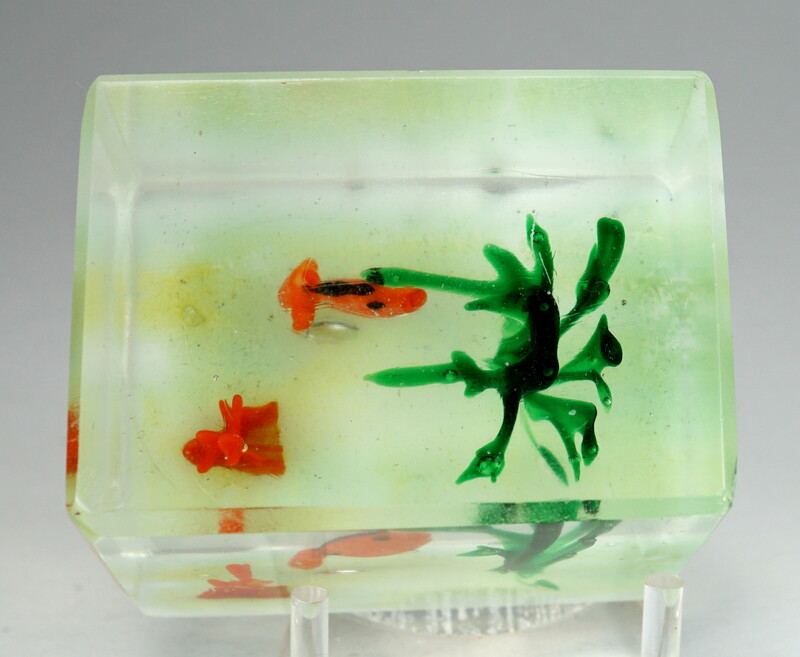 1477 Chinese Aquarium Paperweight with Goldfish and Foliage. This is a Chinese invention. 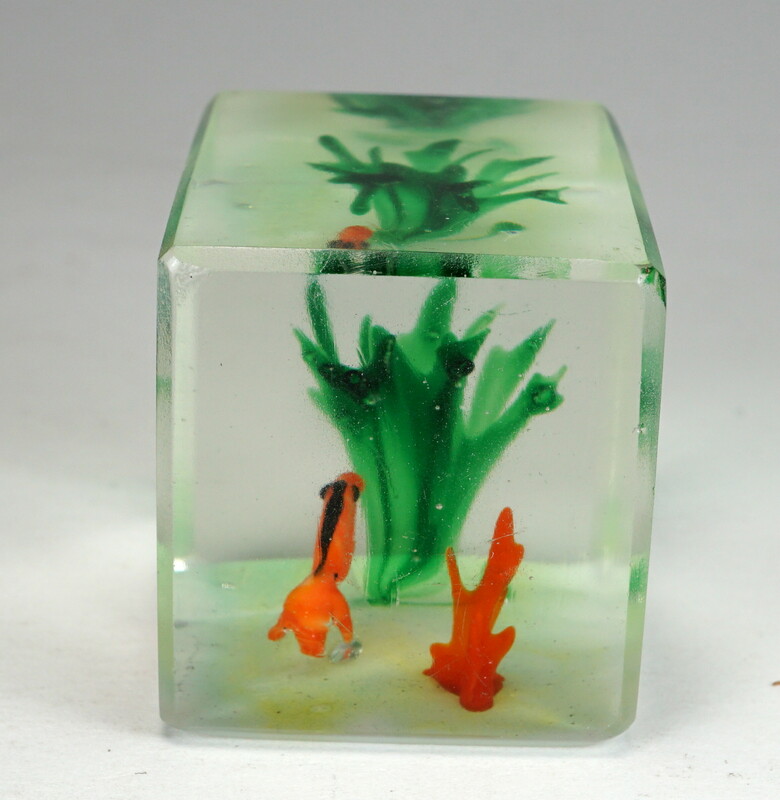 It is intended to be placed in an aquarium along with the rocks and plants. 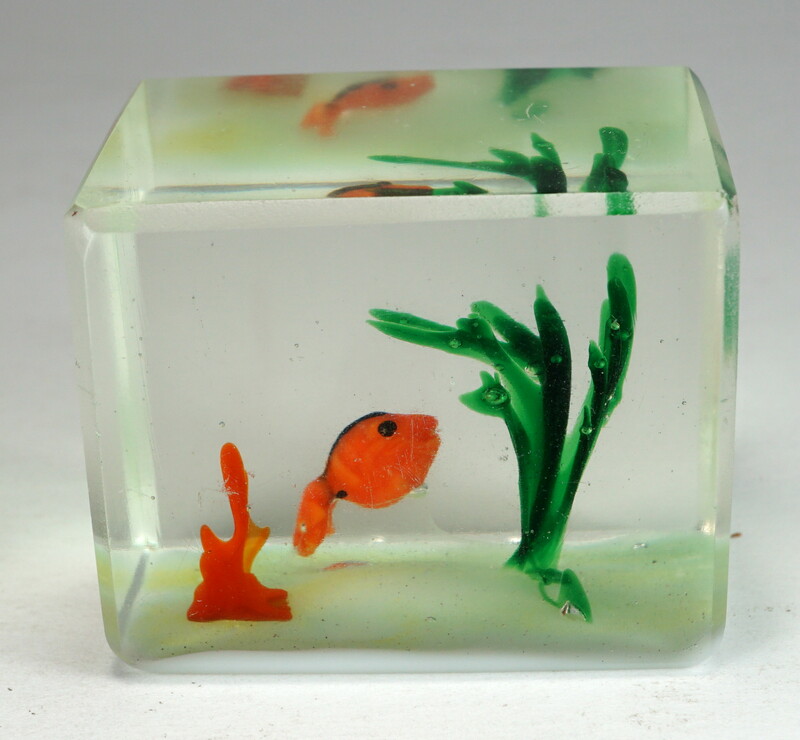 The paperweight features a golden / orange goldfish along with green and red foliage. The composition is placed on a white base and is encased in a rectangular block of glass. The edges of the block are beveled. Novelty items like this started appearing in the US in the 1930s and some were sold at the 1939 World's Fair, but I believe this one may be more recent. A fun collectible. Size: Just under 2” long by just over 1 7/16" deep by just over 1 9/16" high. Condition: Very good condition. One corner has what looks it has been smoothed down. There are a few minor scratches. No other cracks or chips. The glass appears to be good quality but has a slight green tinge. 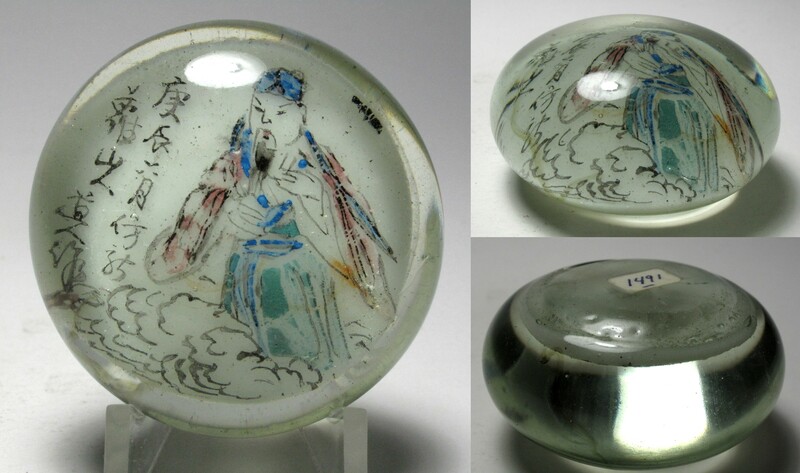 1491 Rare Chinese White Paperweight with Painting of a Chinese Scholar. Circa 1930. 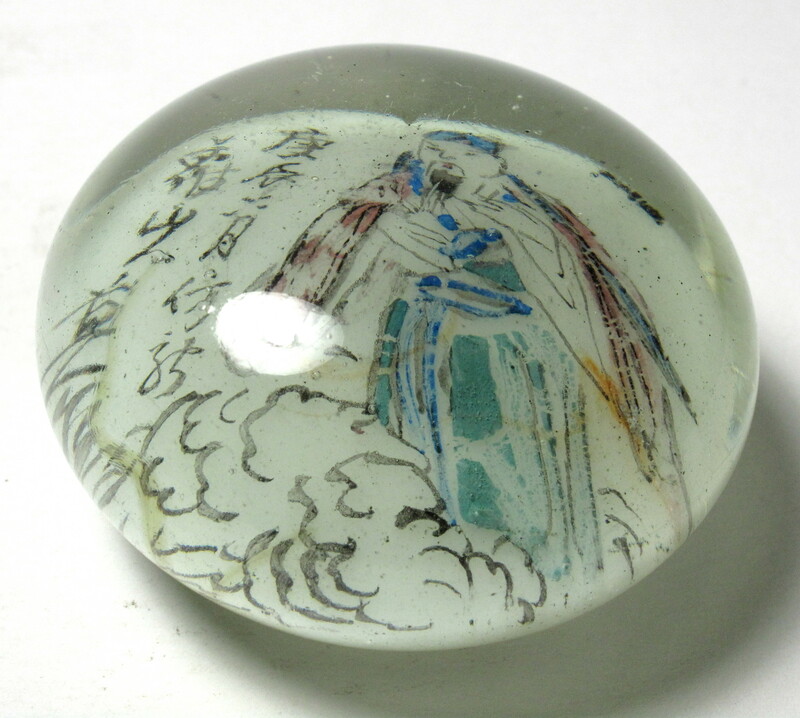 This paperweight has a colored painting of a Chinese scholar surrounded by rock formations. 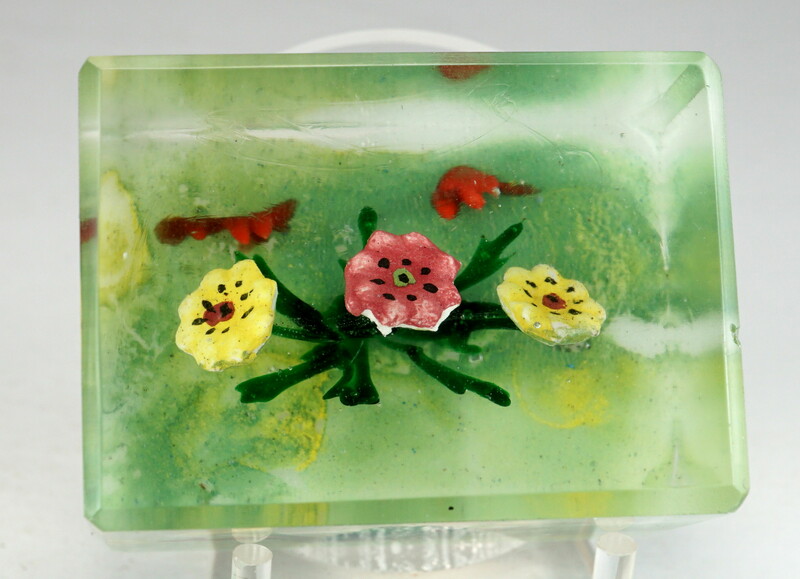 The painting is created on a white enamel base and then encased in glass. There is Chinese writing on the left side. There is a black stroke at the right edge which may be an attempt at an artists signature or it may be just a smudge. The style dates from the 1930s and is almost an antique. Small Size: Just over 2 1/4" diameter by just over 1 1/4" high. The bottom is fire finished. Signature: Scratch signed "CHINA" in the center of the base. This is from China and dates from about 1930. Condition: Very good condition. The surface has a few indentations, but is mostly smooth. No chips or cracks. There is an area of discoloration in the glass and some debris in the glass. 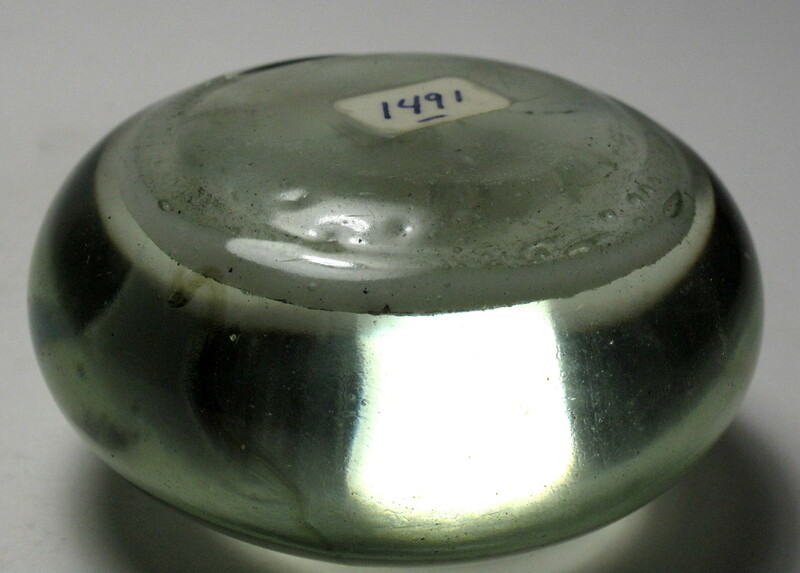 As with Chinese paperweights from this period, this paperweight has a light weight glass mixture that is high in soda and has a greenish tinge. The glass has a soft almost oily feel. There are tiny bubbles in the glass. 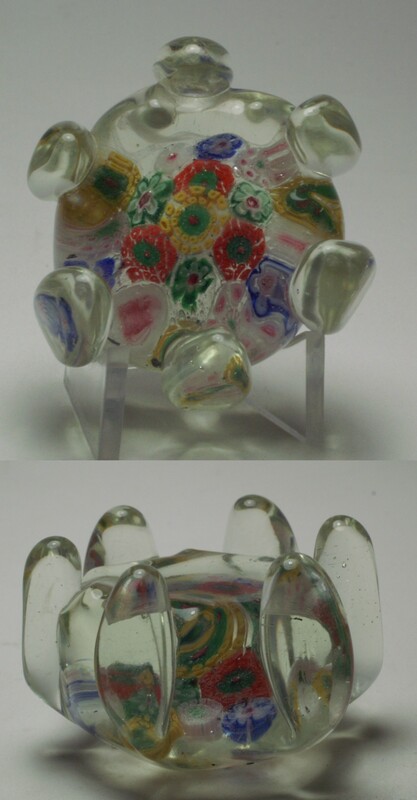 3688 1930s Chinese Millefiori Brushholder Paperweight. c.1930-1940. This is another uniquely Chinese invention. This has also been described as a chopstick holder. Novelty items like this started appearing in the US in the 1930s and some were sold at the 1939 World's Fair. I call this shape the Aladdin's lamp shape. A fun collectible. Size: 2 5/8” long by 1 13/16" tall by 1 3/8" deep. Signature: Scratch signed on the base with the word "CHINA". 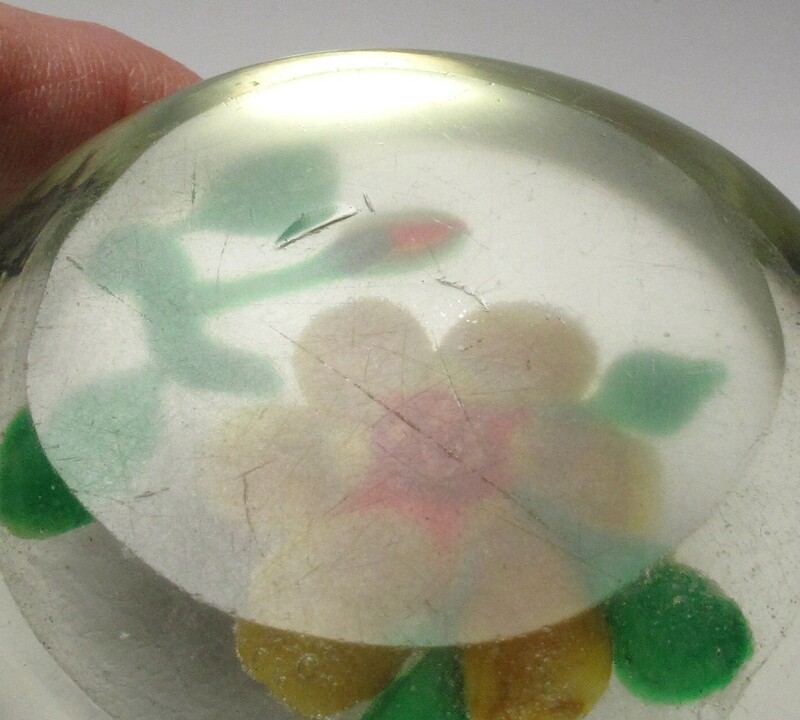 I guarantee that this is an authentic 1930s Chinese paperweight. Condition: Very good condition with no cracks or chips. Some very minor surface scratches. 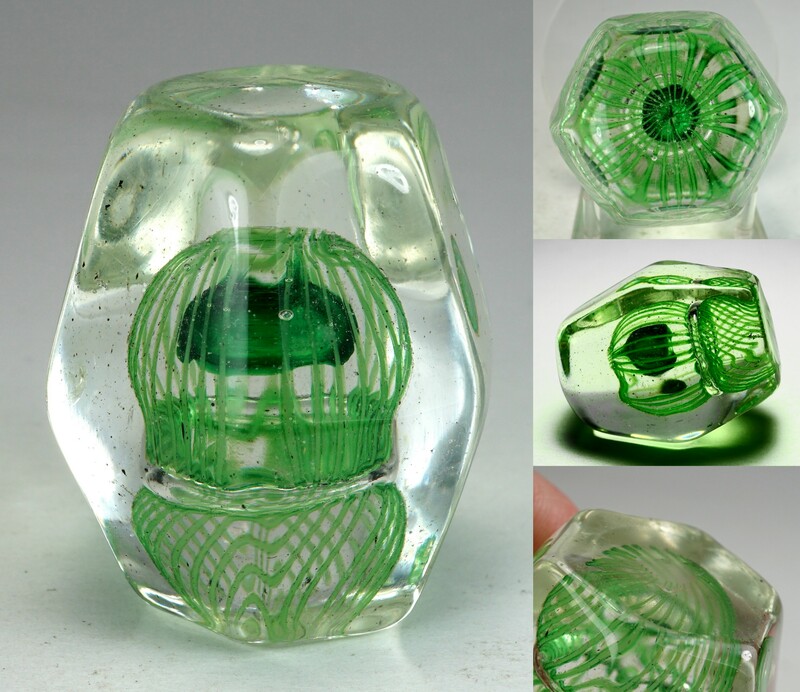 As is typical of Chinese paperweights from this period, the glass has a slightly green tint and has some tiny bubbles and debris in it. 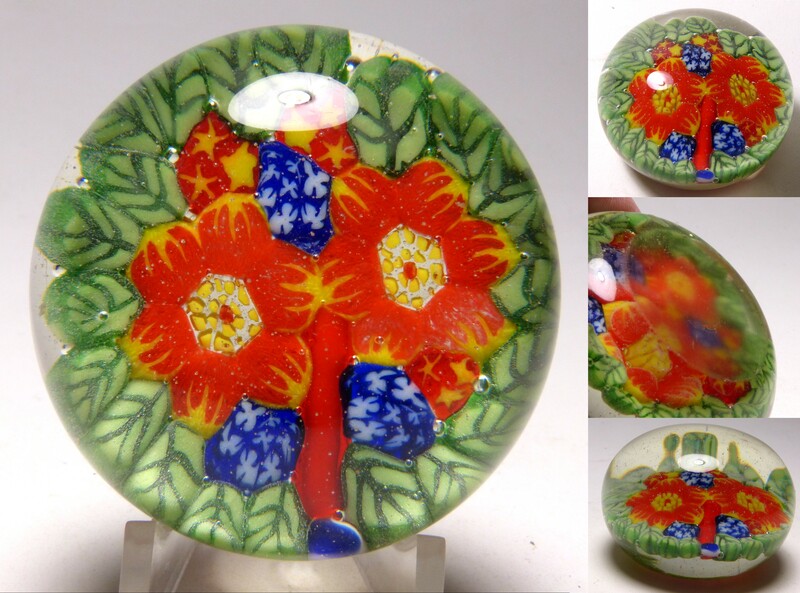 1035 Old Chinese Two Color Fantasy Flower Paperweight with Leaves and Bud - Copy of Baccarat Antique. Circa 1930. 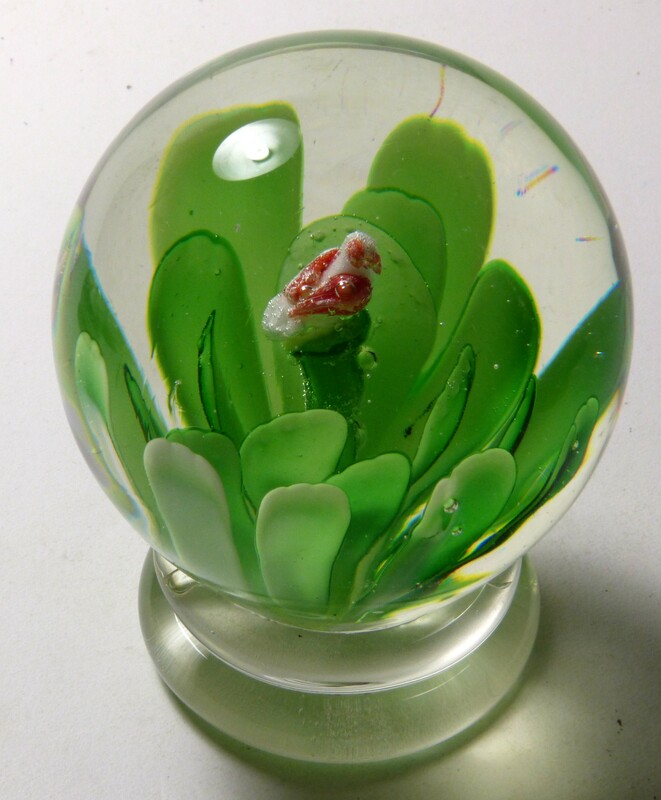 This is a copy of a French Baccarat 12 petal fantasy flower paperweight with bud made in the classic period from 1845-1860. The two color flower has a complex millefiori center cane, five leaves, and a stem. The ground is clear. The style dates from the 1920s or 1930s and is almost an antique. Note: In this example the flower separated slightly from the stem during the stem during encasement. Size: 2 11/16" diameter by 2" high. The bottom is ground flat. Signature: Unsigned but I guarantee that this is from China and dates from about 1930. Condition: Very good condition. There are some minor scratches on the body and one 3/16" chip on one side. The base has age appropriate wear. 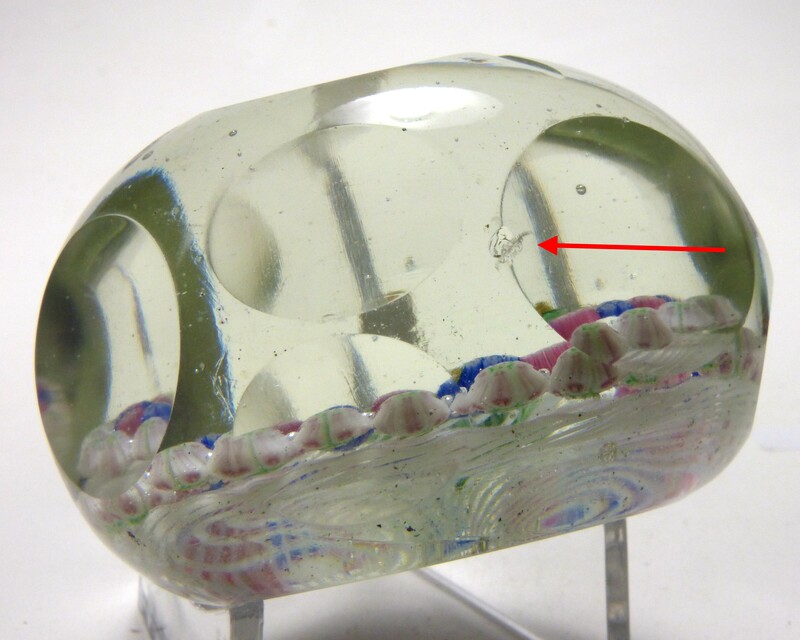 As is typical to weights of this type, the glass has some debris and tiny bubbles. 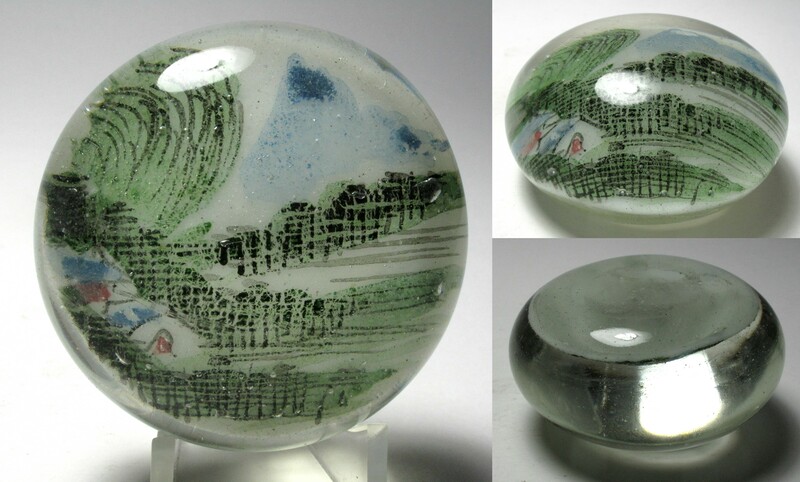 As with Chinese paperweights from this period, this paperweight has a greenish tinge and a soft almost oily feel. In this example the flower separated slightly from the stem during the stem during encasement. $39 postage paid in the US. 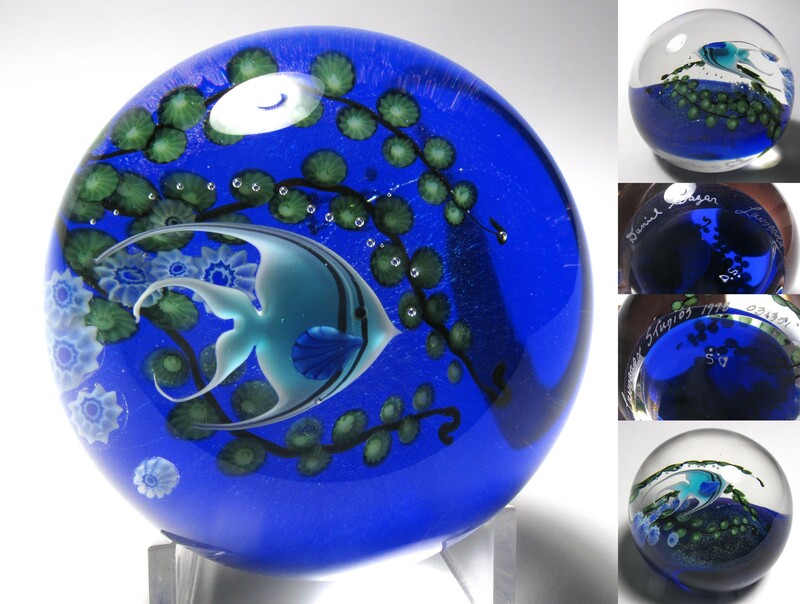 1885 Chinese 1930 Tetradecahedron Double Marble Aquarium Paperweight. circa 1930. 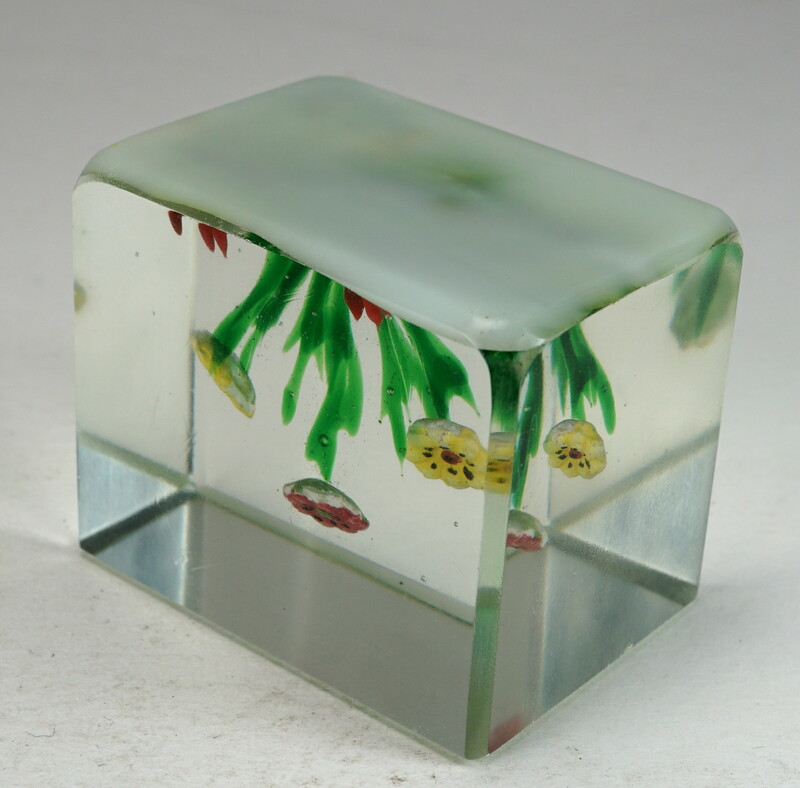 This paperweight features a double marble inside a 14 faced three dimensional figure. It is a uniquely Chinese invention. 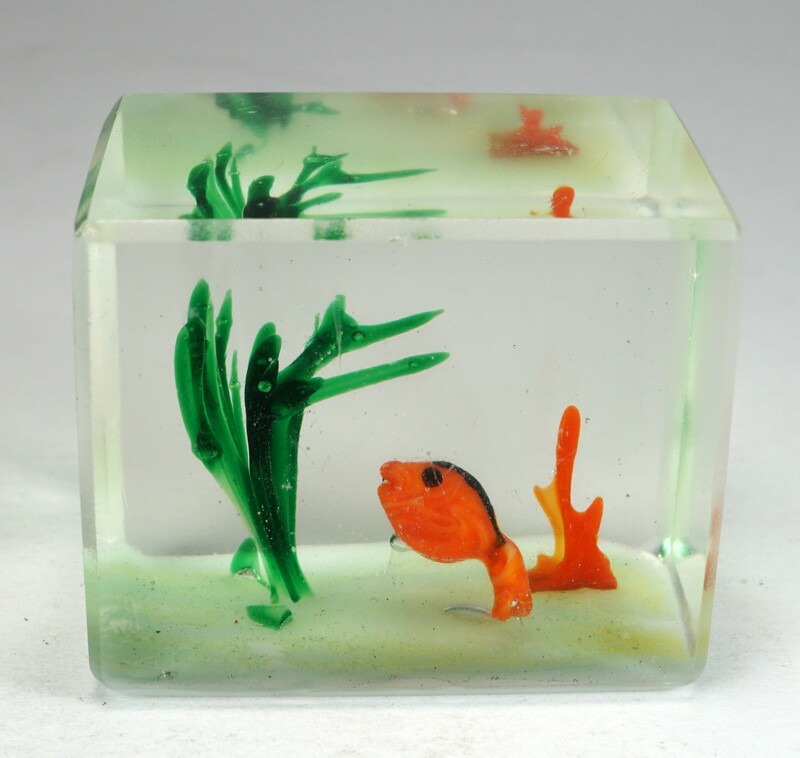 It is intended to be placed in an aquarium along with the rocks and plants. The inner two spheres inside resemble a double marble. The figure can be referred to as a tetradecahedron or more specifically as a hexagonal bifrustum. The top and bottom are hexagon shaped, the other twelve faces are trapezoidal. Novelty items like this started appearing in the US in the 1930s and some were sold at the 1939 World's Fair and I believe this is an early example. A fun collectible. Size: Just under 1 15/16” long by 1 11/16" wide. Condition: Good condition. One corner has a small impact fracture. There are a few minor scratches. No other cracks or chips. The glass is poor quality, has a green tinge, and has quite a bit of dirt of debris or dirt in it. 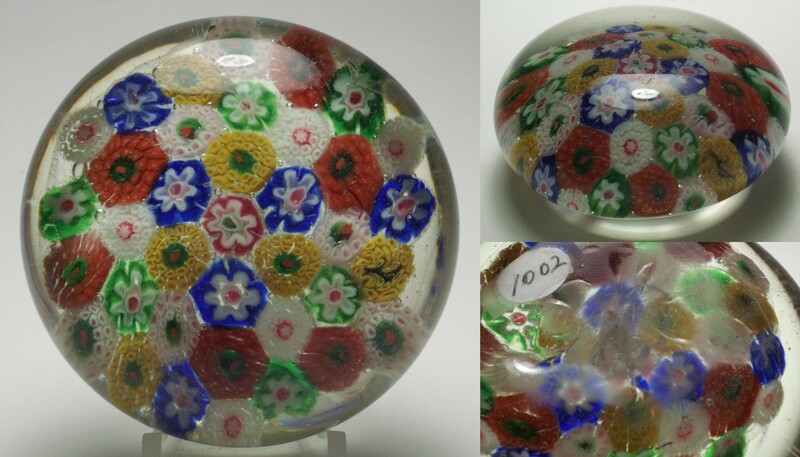 1002 Signed 1930s Chinese Closepack Millefiori Paperweight. c.1930. 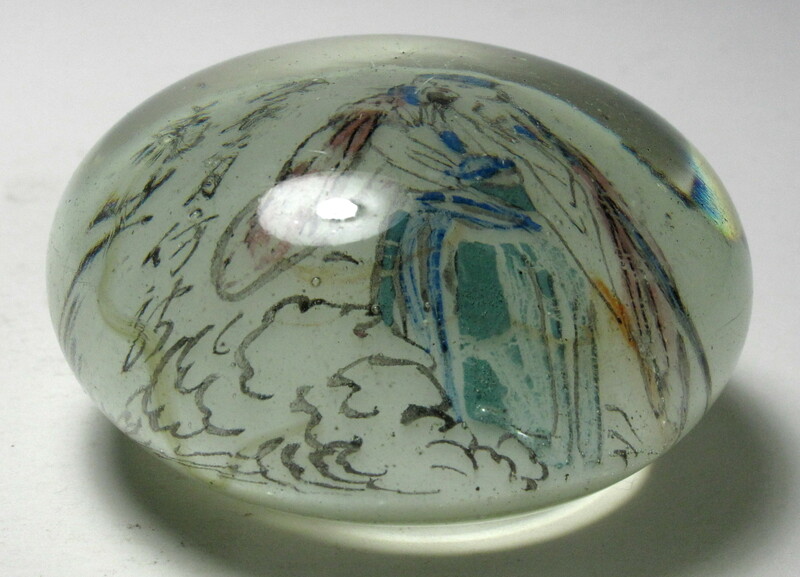 This is a copy of a French antique paperweight from 1845-1860. Most likely it was based on a Clichy closepack design. Clear ground. A nice example with great color. Large Size: 2 7/8” diameter by just under 1 1/2" high. Signature: Scratch signed "CHINA" on the bottom. Condition: Very good condition with no cracks or chips. Some very minor surface scratches. 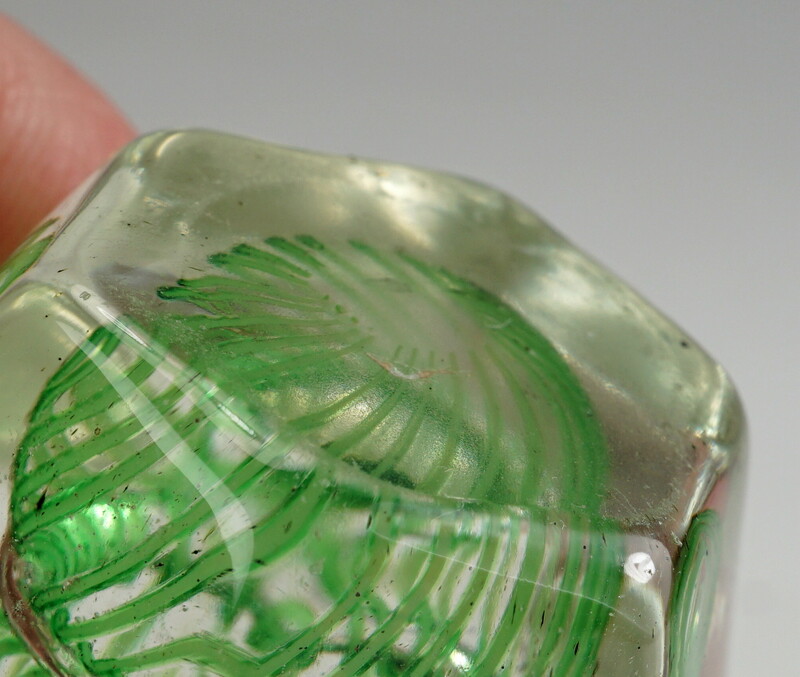 As is typical of Chinese paperweights from this period, the glass has a slightly green tint. $55 postage paid in the US. 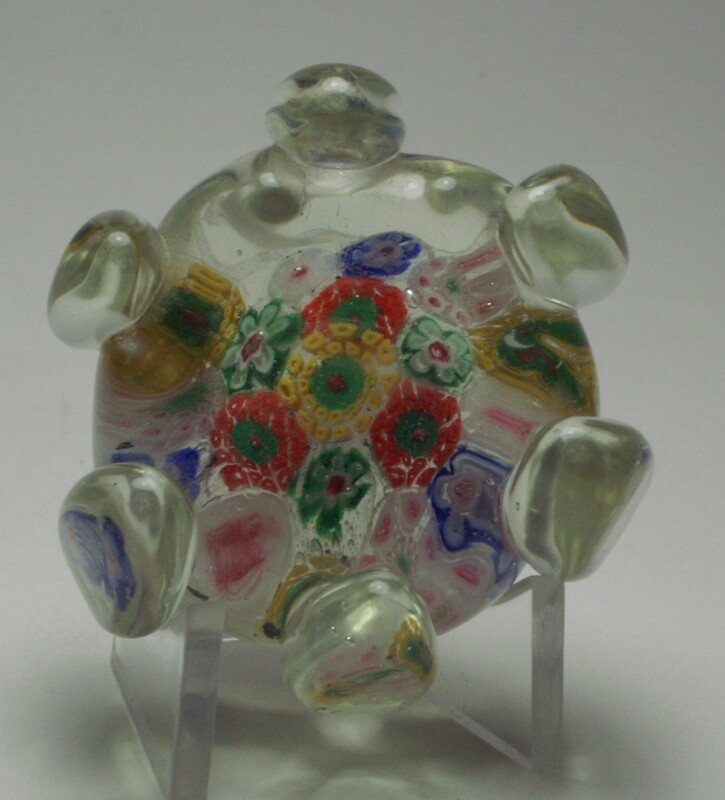 1568 1930s Chinese Millefiori Brushholder Paperweight. c.1930-1940. This is another uniquely Chinese invention. This has also been described as a chopstick holder. Novelty items like this started appearing in the US in the 1930s and some were sold at the 1939 World's Fair. I call this shape the lotus flower shape. It has a floral shape with applied petals around the outside. Size: 2 1/8" diameter by 1 1/3" high. Signature: Unsigned but I guarantee that this is an authentic 1930s Chinese paperweight. 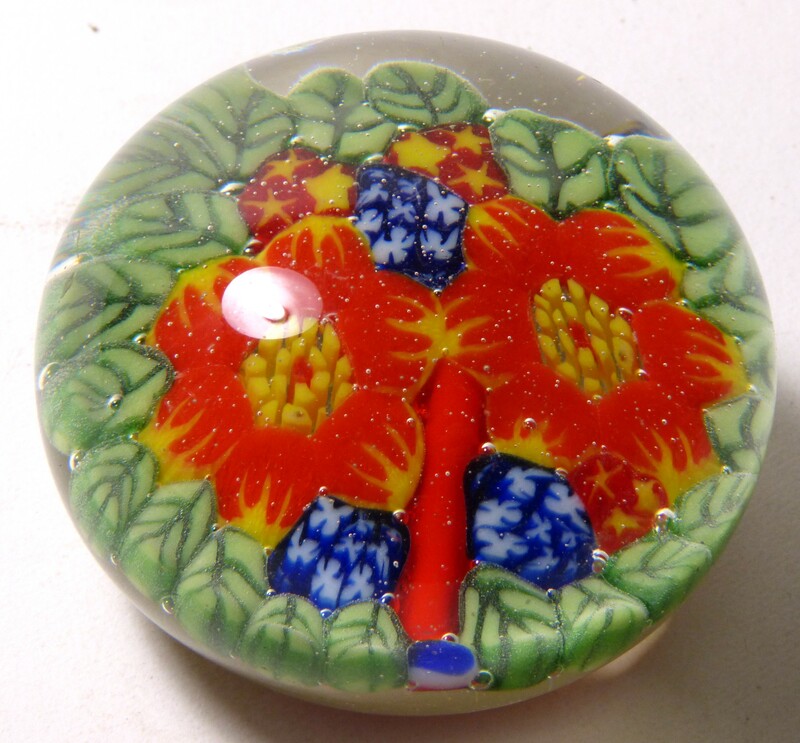 2045 Unusual Chinese Mosaic Butterfly Millefiori Paperweight. circa 1950-70. Unusual Chinese millefiori with mosaic canes arranged in the shape of a butterfly over a green leaf ground. Not a lot is known about this style. Sometimes there is a flower cane or some Chinese writing in the design. The style is believed to be from 1950-1970. Small Size: Just over 2 5/16" diameter by just over 1 5/8" high. The bottom is ground concave with a remnant of the pontil mark remaining. Signature: Unsigned but I guarantee that this is from China 1970 or earlier. Condition: Very good condition with no chips or cracks. Some minor surface scratches and pinpricks. 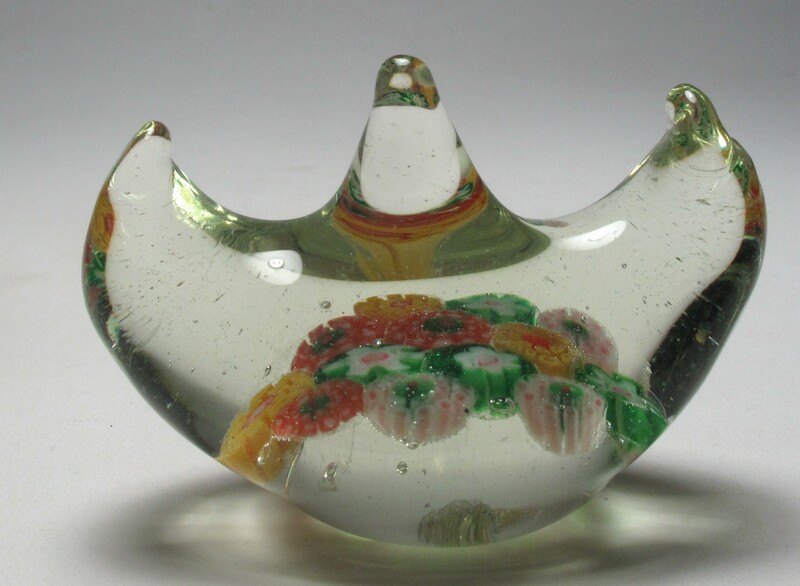 4616 Large Chinese Pedestal Flower with Bird Paperweight. Probably 1970 or later. This is a good example of a Chinese adaptation of features of older American weights. 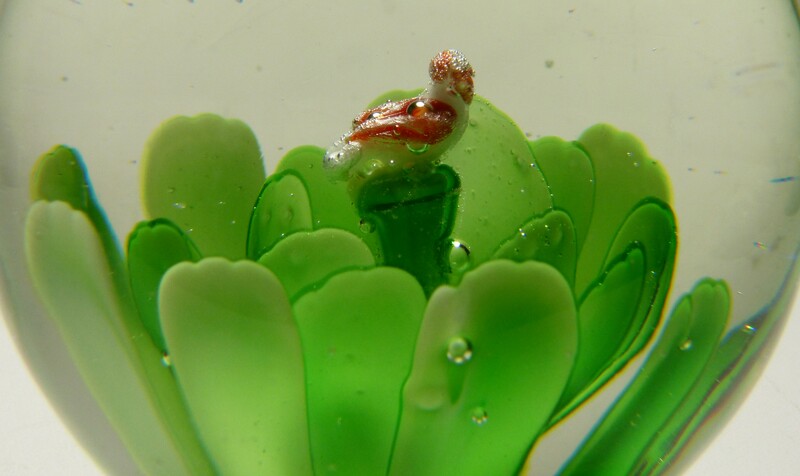 It features a crude lampwork bird sitting on top of a green flower mounted on a pedestal form. The pedestal form is generally associated with Chinese copies of Millville crimp roses. The bird in this setting is uniquely Chinese. The pedestal has a double foot. An interesting addition to any collection of paperweights. I believe believe this is a recent example dating from 1970 or later because the variety was not documented earlier and the thin leaves are more typical of post 1970 Chinese flowers. 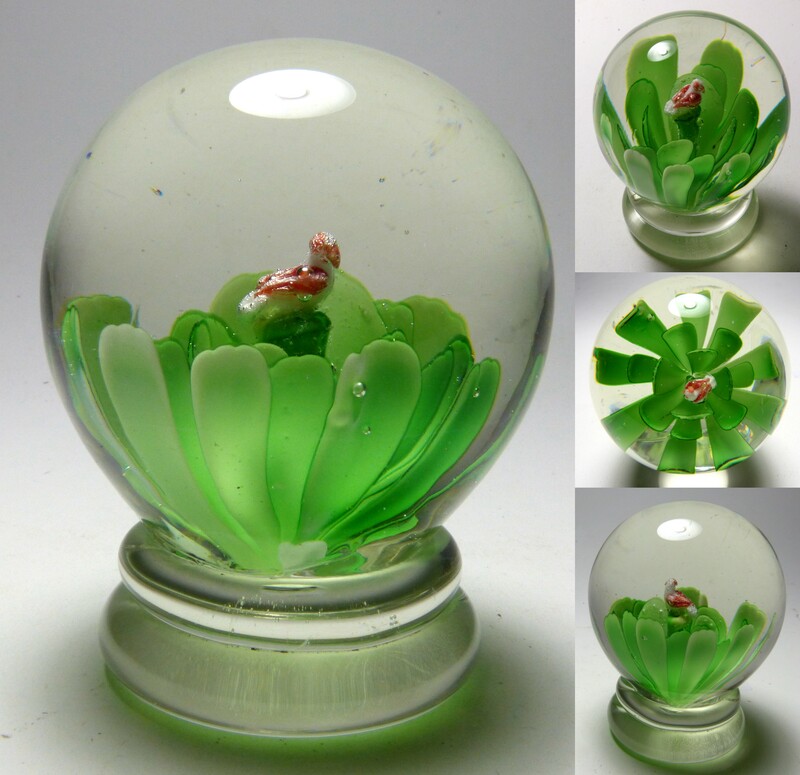 In general, Chinese paperweights from the 1930s have a light weight glass mixture that is high in soda and has a greenish tinge. The glass also has a soft almost oily feel. Frequently they have bubbles or debris in the glass. And because of their age, many of these have minor scratches or other surface defects. Those made in the 1970s and later have better quality glass. Large Size: Just under 2 3/4” diameter by just under 3 1/2" high. The pedestal bottom has the remainder of the pontil mark. Signature: Unsigned, but I guarantee this paperweight was made in China, most likely in the 1970s or later. Condition: Good condition with a few light scratches on the top. The longest scratch is just under 1/4" long. No cracks or chips. 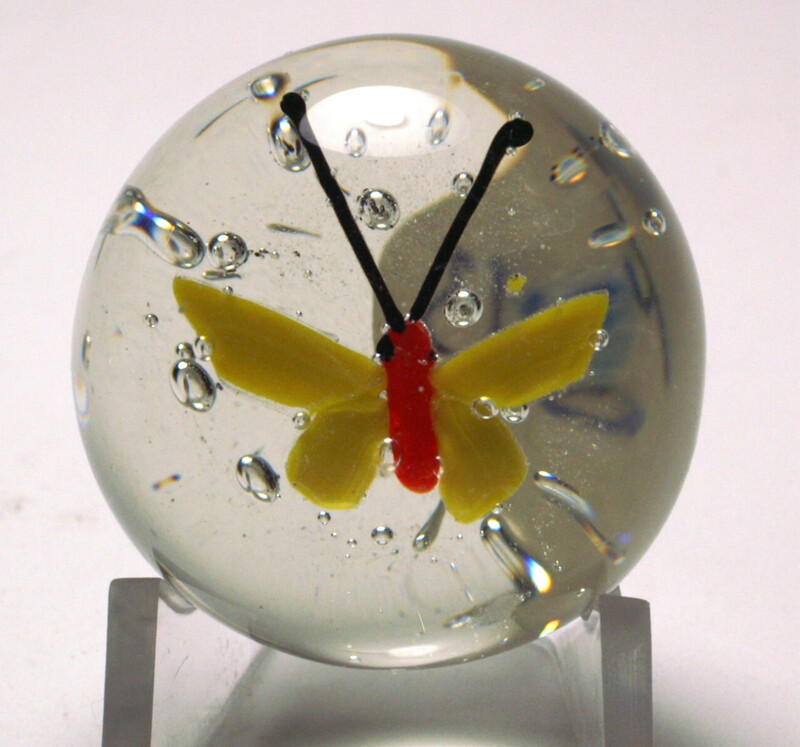 543 Chinese Miniature Butterfly Paperweight. circa 1930-1970. 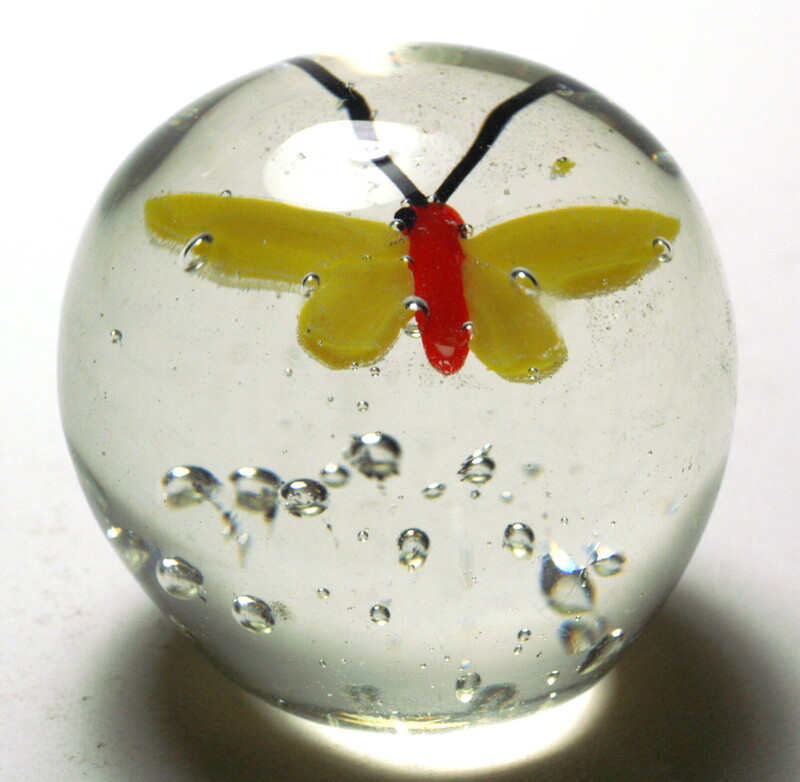 This miniature paperweight features a yellow and orange lampwork butterfly flying with wings extended over a bed of bubbles. The white are in the picture is my inventory label showing through. Please ignore it. Miniature Size: 1 5/8” diameter by 1 1/2" high. The bottom is ground concave. Signature: Unsigned, but I guarantee that this is made in China, most likely from the early period (1930 to 1950), but possibly later. Condition: Excellent condition with no cracks or chips. No significant scratches found on inspection, but there may be some tiny scratches not noticed. 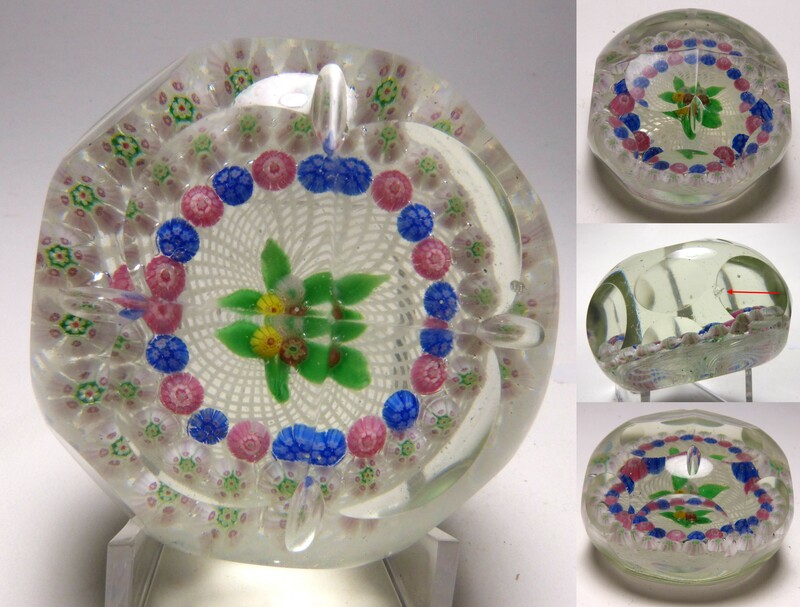 2456 Faceted Chinese Pansy Paperweight. circa 1930. 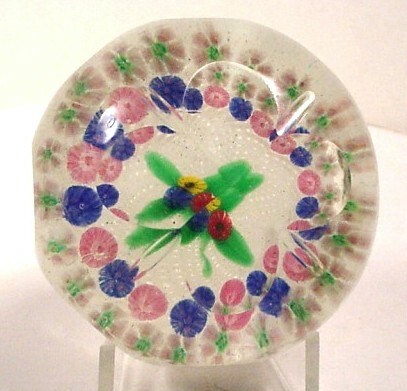 This is a copy of a Baccarat Type III Pansy paperweight from France made in the classic period from 1845-1860. 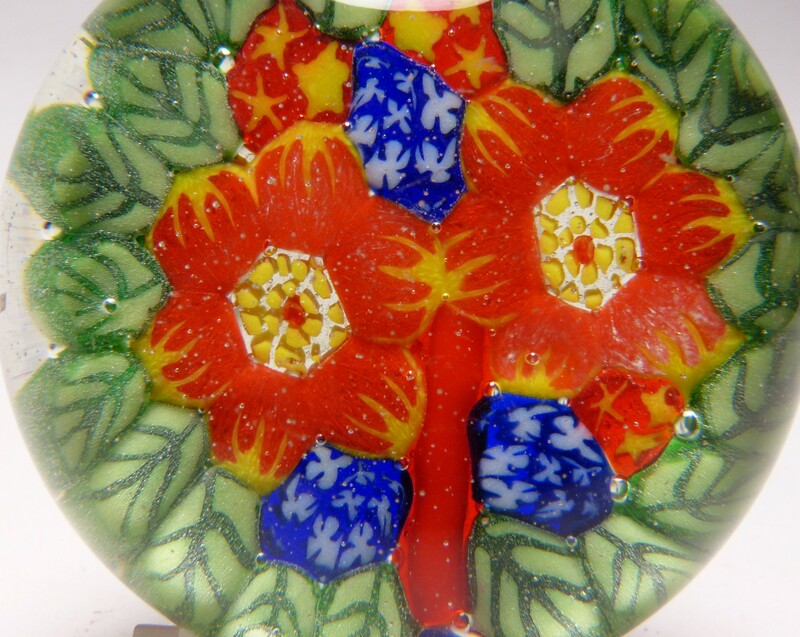 There is a lampwork pansy with millefiori center, plus stem, buds, and leaves. 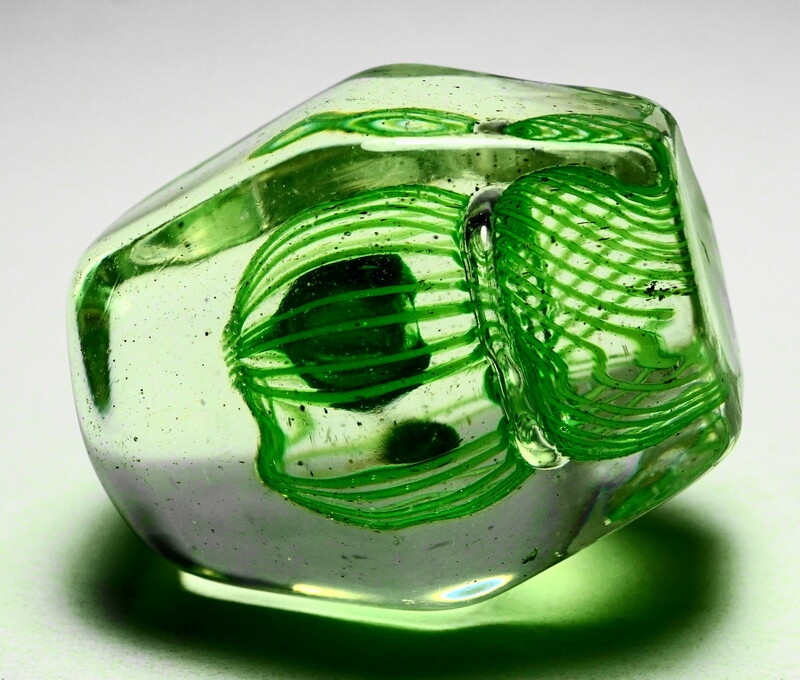 This paperweight has spiral latticinio ground, sometimes called a double latticinio ground because of the way the rods cross back on each other. This is a splendid example with one top facet and 17 side facets. 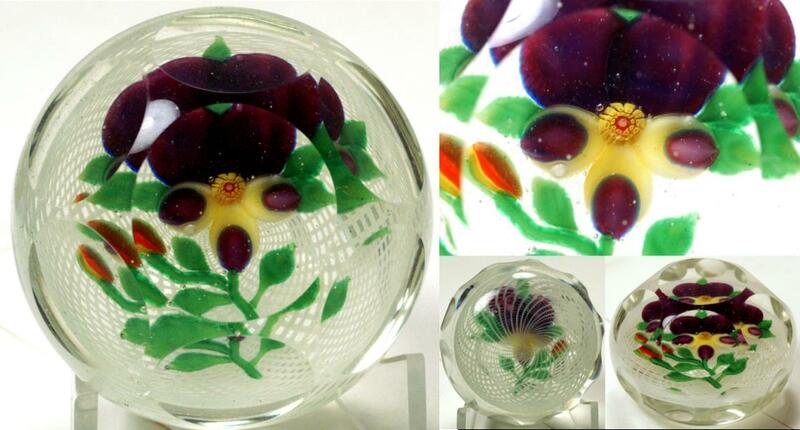 This paperweight was made to fool the collector into believing they are getting the real antique Baccarat Pansy. It is a very good copy, but Baccarat never used latticinio grounds. 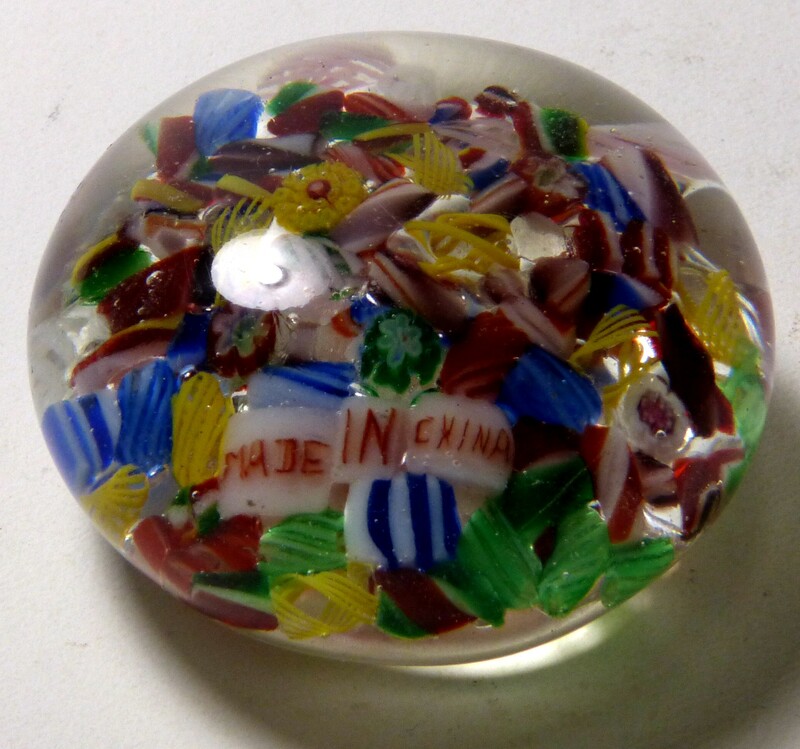 The Chinese learned to make the latticinio grounds by copying those from New England Glass Company paperweights. 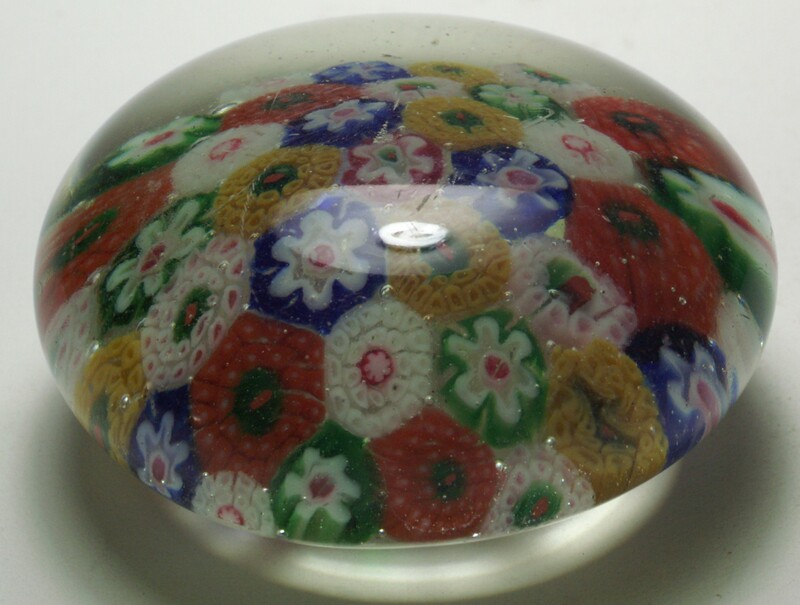 Chinese paperweights like this have become very collectible. With its faceting, this is a superb example and is worthy of any collection. Size: Just over 2 3/4" diameter by 2" high. Unsigned. Excellent condition with no chips or cracks. 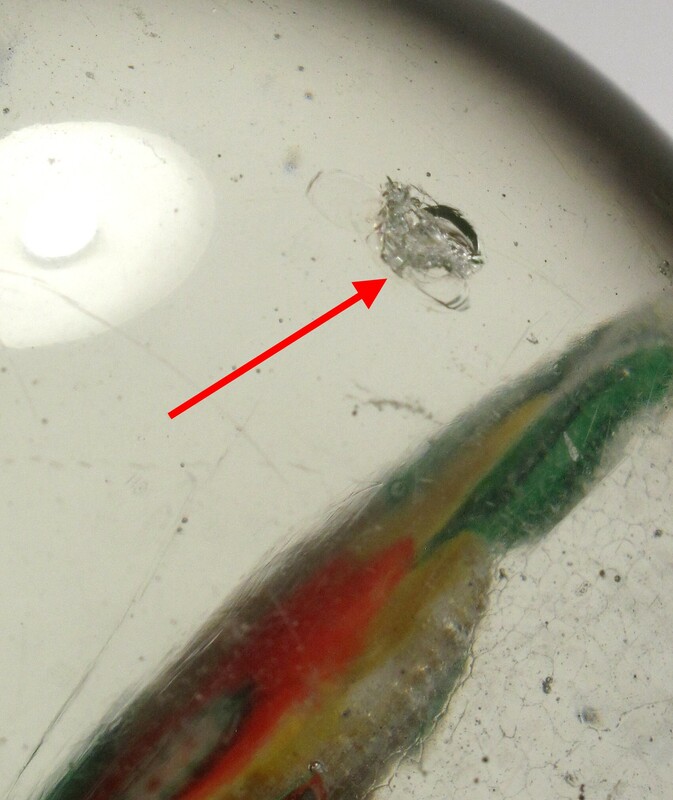 There are some very light surface scratches and some tiny nicks on the facets. The base is ground concave. Listed in Hall's book with a price guide of $450-500. 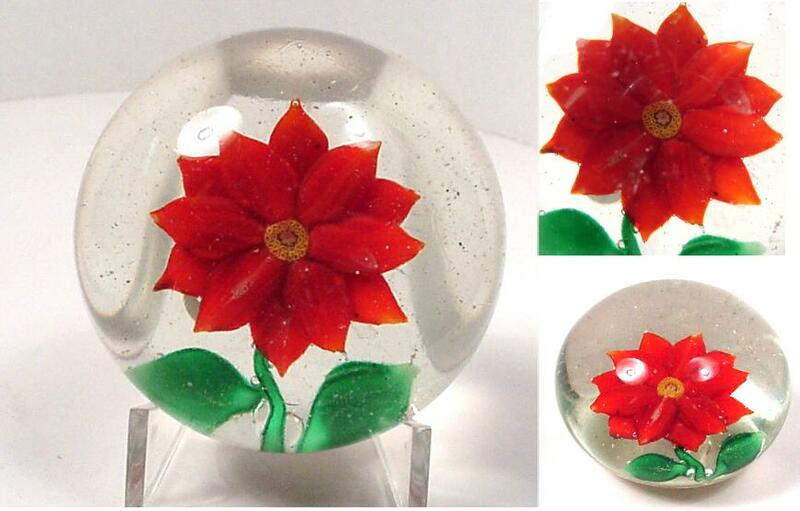 557 Chinese Red Poinsettia Paperweight. c.1930. This is a copy of a Boston and Sandwich Glass Company (Sandwich, Massachusetts) Red Poinsettia made in 1869. Millefiori center. Clear ground. Size: 2 3/4" diameter by 2" high. Scratch signed CHINA on the bottom. The bottom has been ground flat. Excellent condition. 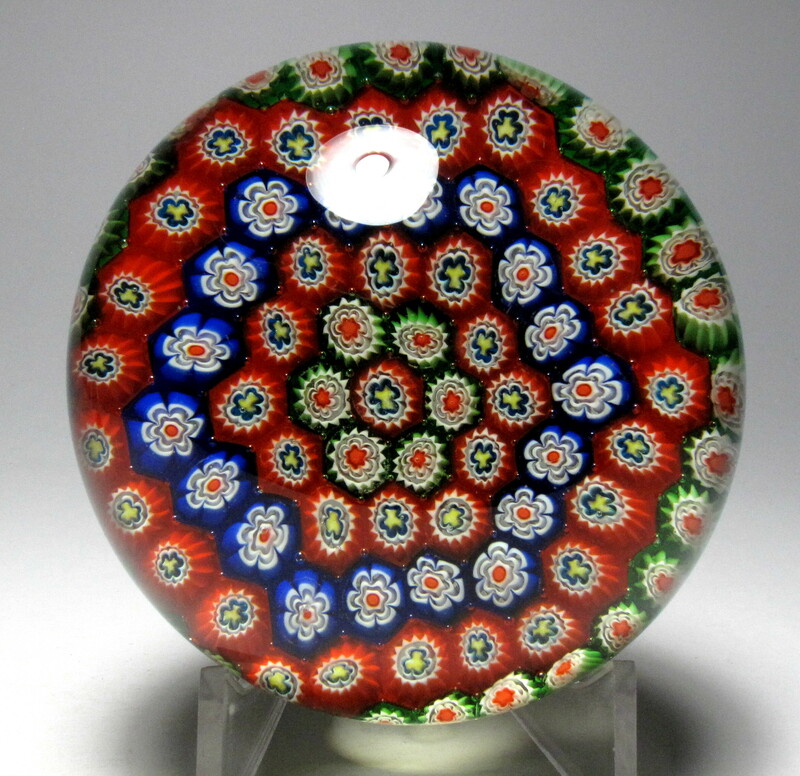 2454 Chinese Concentric Millefiori Paperweight. c.1930. 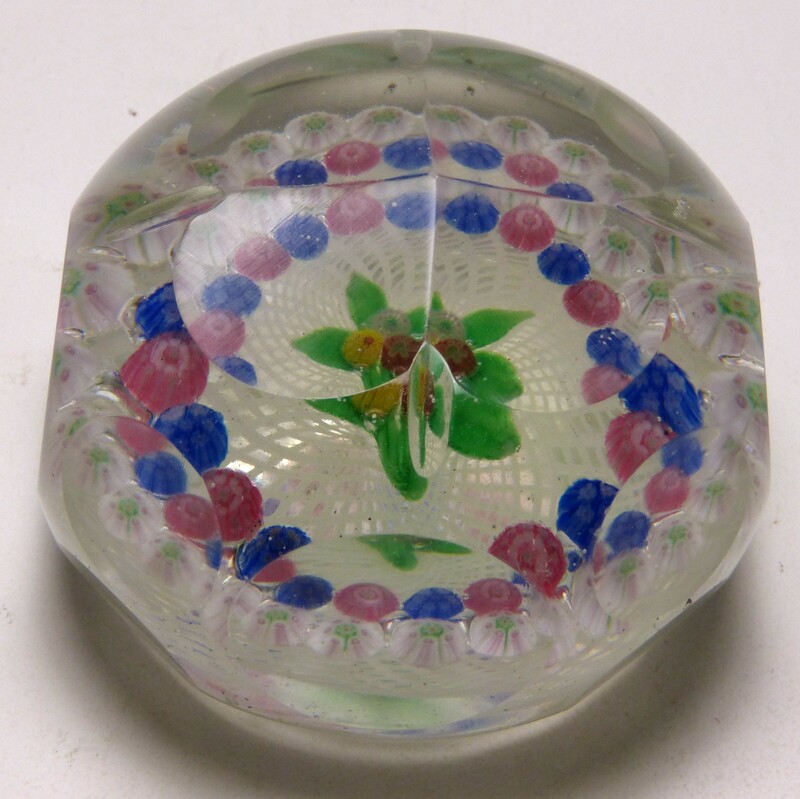 This is a copy of a Clichy paperweight from France made in the classic period from 1845-1860. Clear ground. A nice example although there is quite a bit of dirt in the glass. Size: 2 1/2" diameter by 1 1/3" high. Not signed. One small chip on the side plus some pitting in the glass. $35 postage paid in the US. 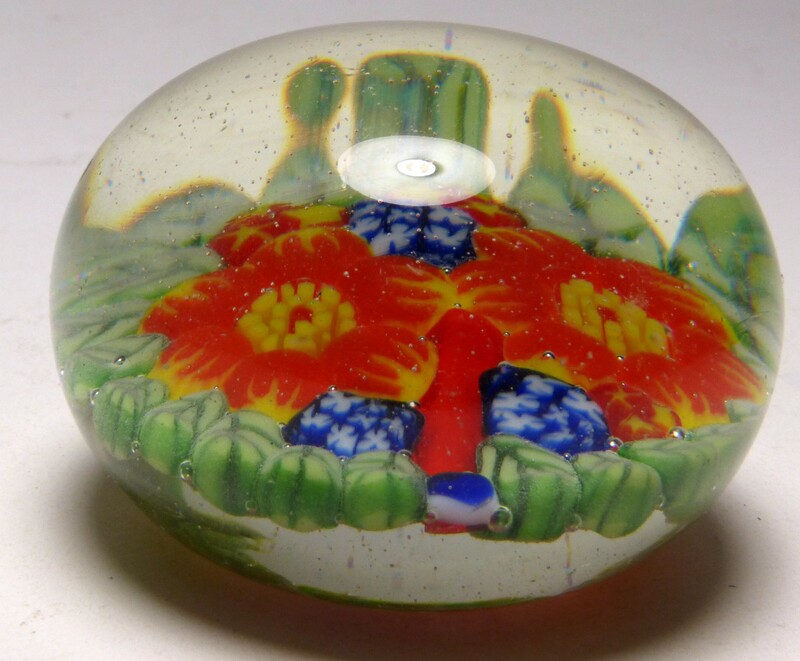 2496 Rare Chinese Copy of a NEGC Faceted Millefiori Nosegay Paperweight. circa 1930. 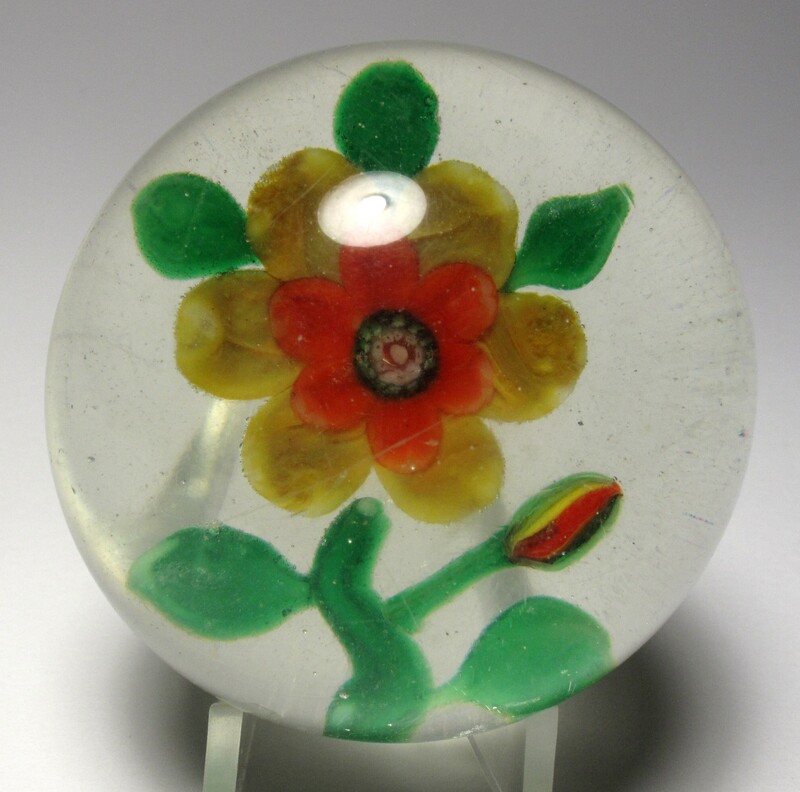 This is an almost antique Chinese copy of a New England Glass Company (NEGC) Posy Paperweight made circa 1860. It has the fancy NEGC quatrefoil faceting and setup. The millefiori nosegay consists of three red, white, and yellow complex millefiori canes with four green leaves and a stem. All this surrounded by two garlands of complex millefiori, one made up pink and blue flowers, the other made pink and white flowers with green centers. This great setup is on top of a latticinio swirl ground. There are twelve side facets (four large and eight smaller) plus the four part top facet with a notch between each. 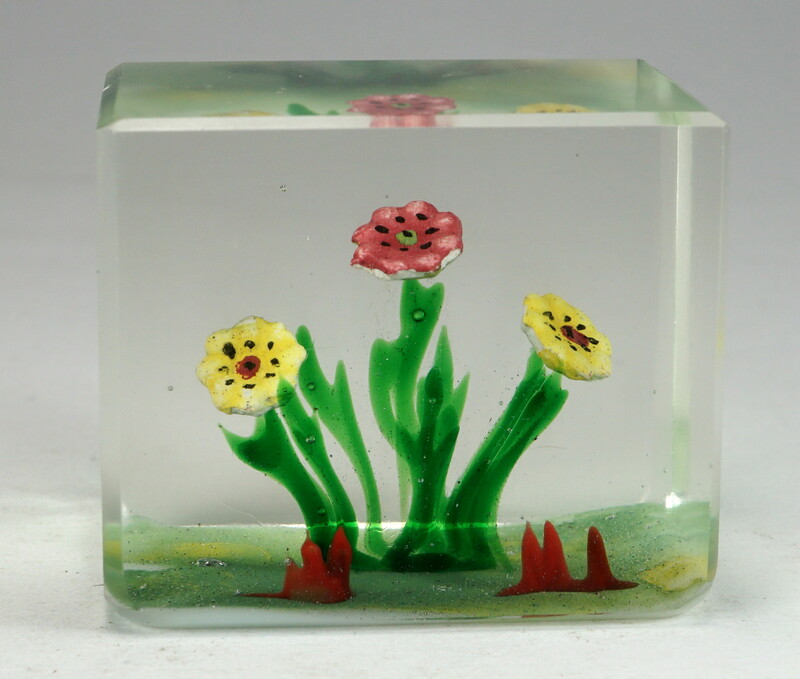 This is a fantastic addition to any collection of antique paperweights. In some ways, the execution of this example is better than the original NEGC, since NEGC examples usual have tipped or cracked canes and the posy is often smudged. Large Size: Just under 3" diameter by 2" high. The bottom is ground concave. Condition: Very good condition. There are some minor surface scratches and pinpricks and also some tiny pinpricks on the facets plus one 1/8" chip on a facet (see picture). There is some debris or dirt in the glass as shown in the pictures. 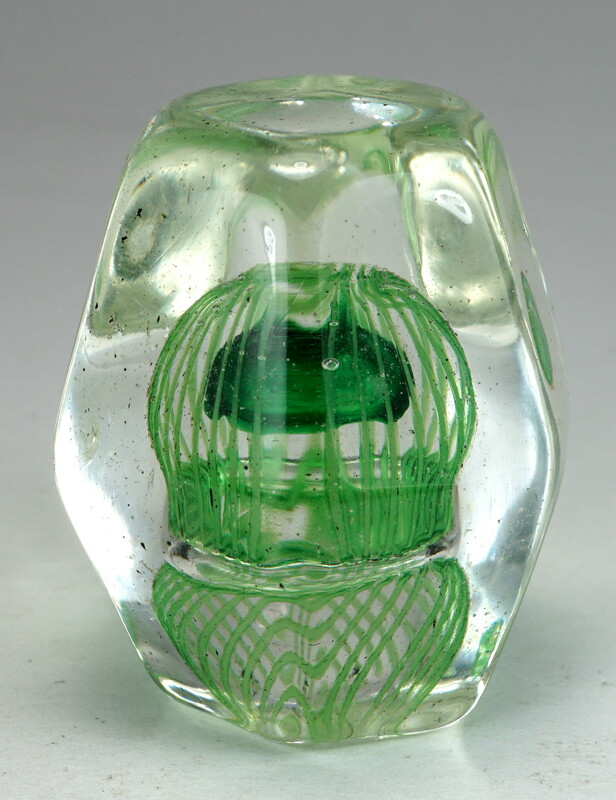 As with all Chinese paperweights from this period, this paperweight has a light weight glass mixture that is high in soda and has a greenish tinge. The glass has a soft almost oily feel. $225 postage paid in the US. 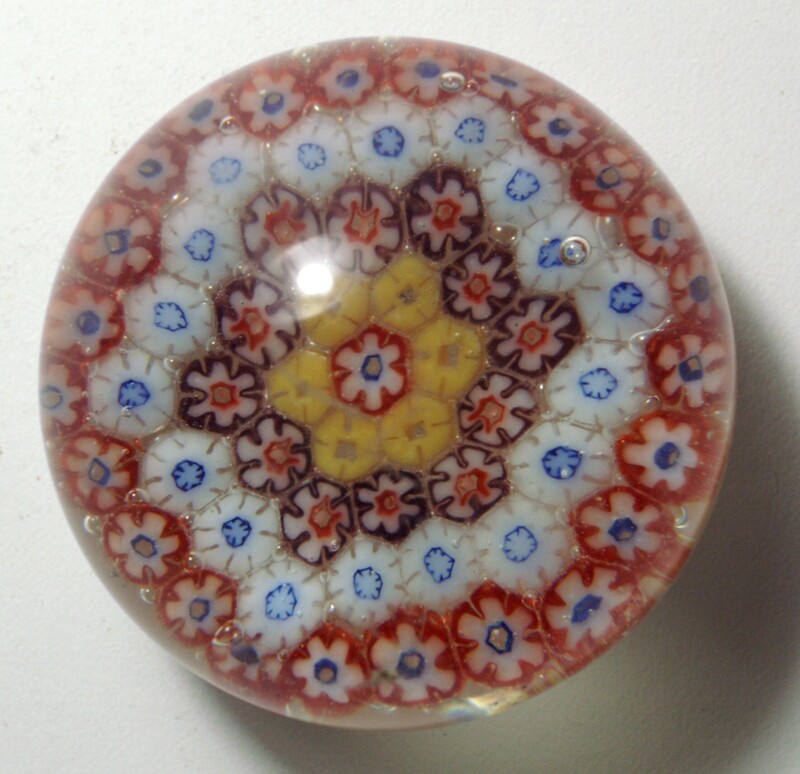 1447 Chinese Concentric Millefiori Paperweight. circa 1930. 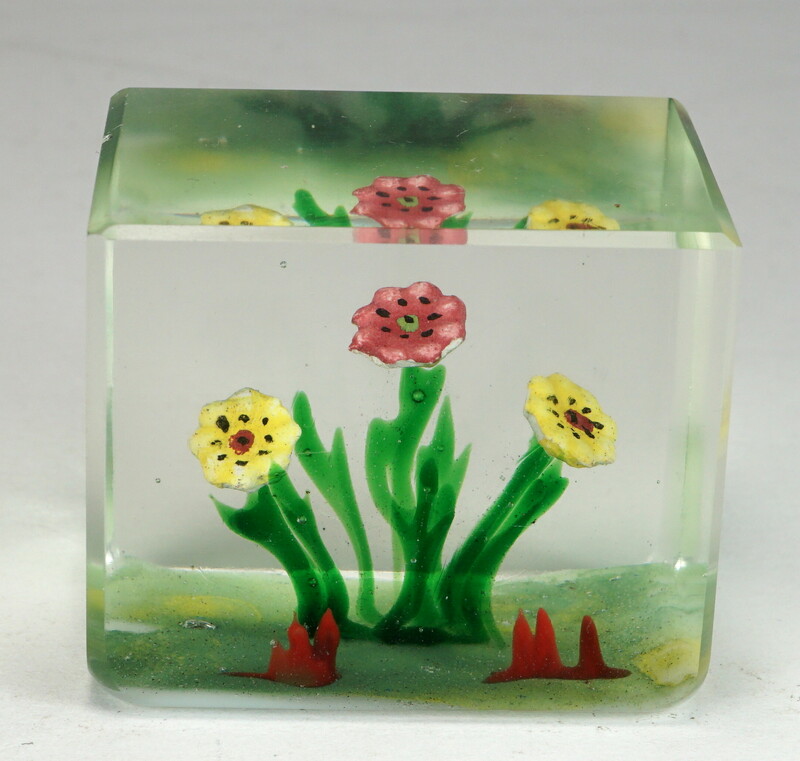 This is a copy of a Clichy paperweight from France made in the classic period from 1845-1860. Clear ground. 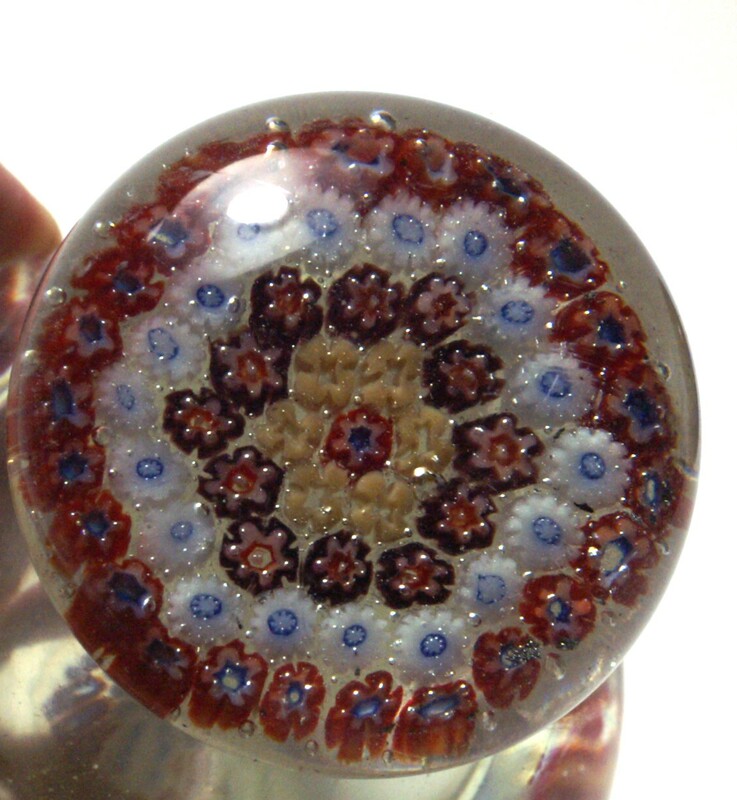 This type is not as common as the other patterned millefiori weights, nor is it as intricate. The millefiori canes are simple canes. Perhaps it was made later or perhaps by a different factory. Small Size: 2 3/8” diameter by just under 1 7/8” high. Signature: Unsigned, but the attribution is guaranteed. 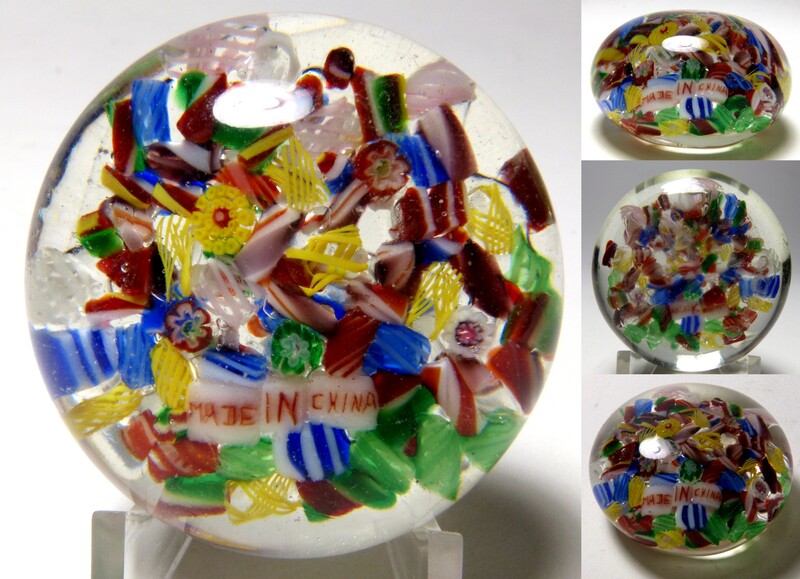 Condition: Good condition typical of Chinese paperweights from this period. No cracks or chips, but it does have some scratches and surface abrasions mostly on the side of the paperweight. 2041 Rare Chinese Enameled Clipper Ship Plaque Paperweight. c.1930-1940. This is a uniquely Chinese invention. 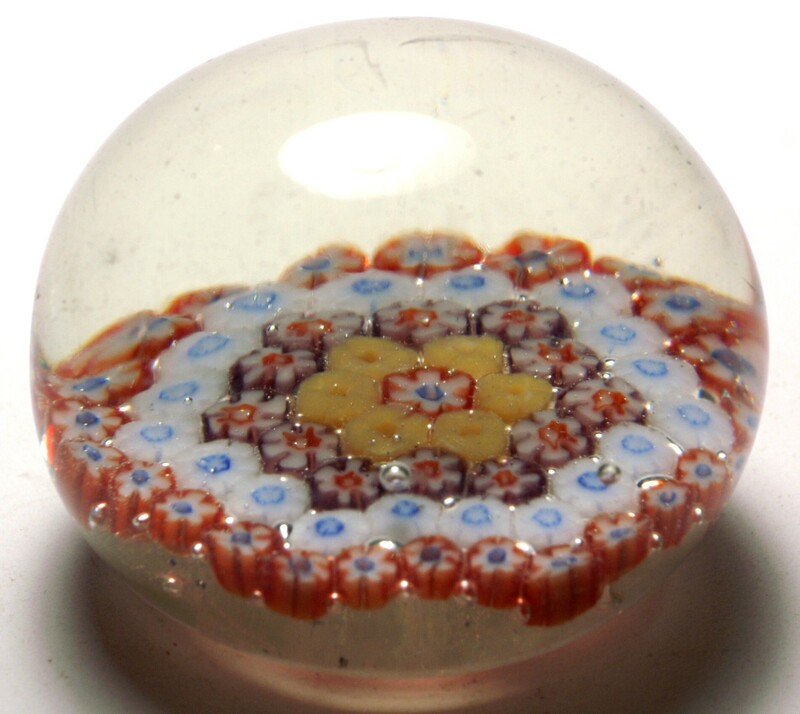 This paperweight is shown in Hollister's Encyclopedia of Glass Paperweights (Figure 2.36). It is an enamel painting of a ship on a white enamel plaque. This is a collectible example of a hard to find style. Size: 2 1/3" diameter by 1 3/8" high. Unsigned. Good condition. The surface has a number of scratches and small pit marks. The glass has a noticeable amount of debris in it. 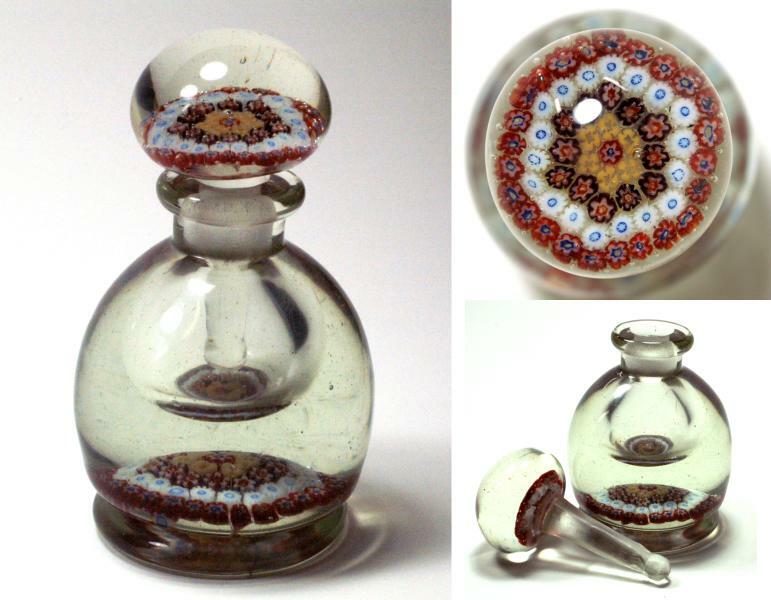 2238 Chinese Millefiori Perfume Bottle or Inkwell. c.1930. 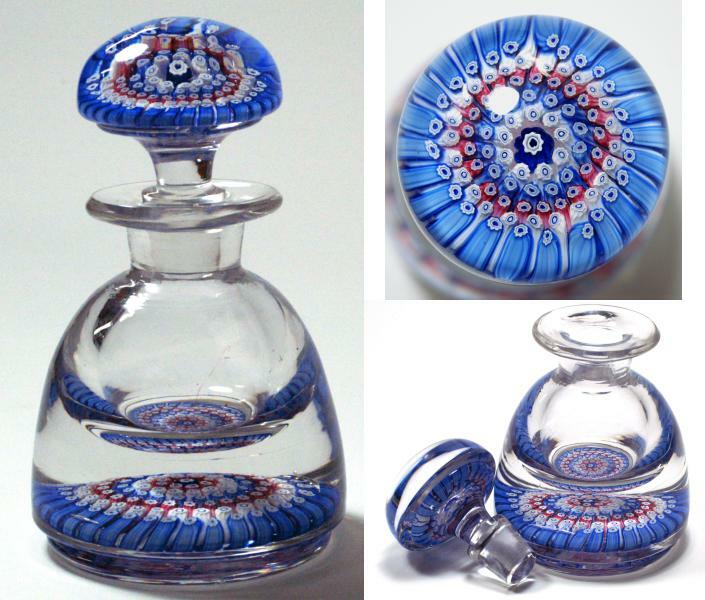 Matching concentric millefiori pattern in the base and the stopper. 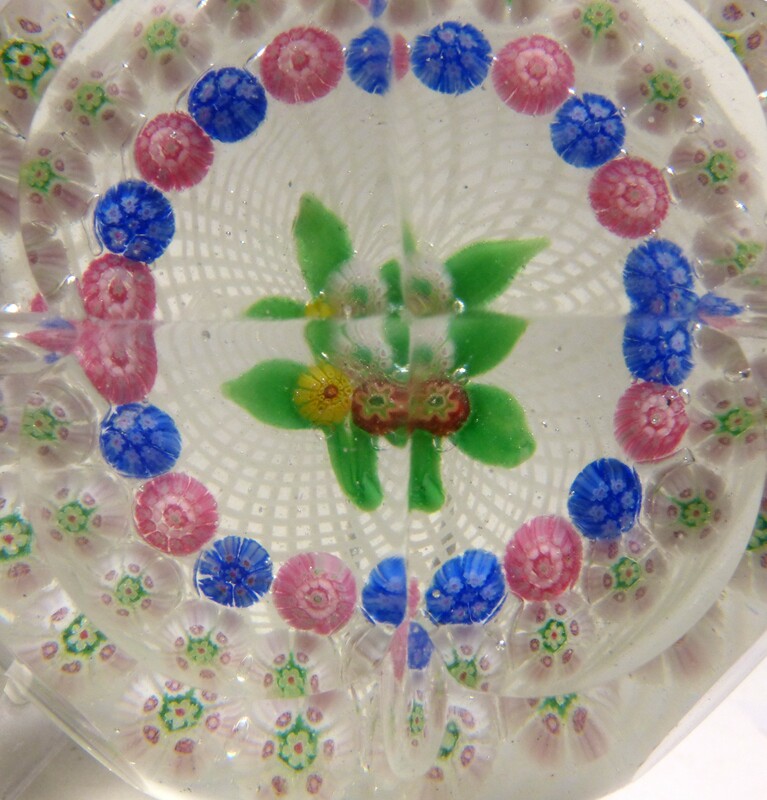 Each has four rings of millefiori around a central floral cane. The base is footed. 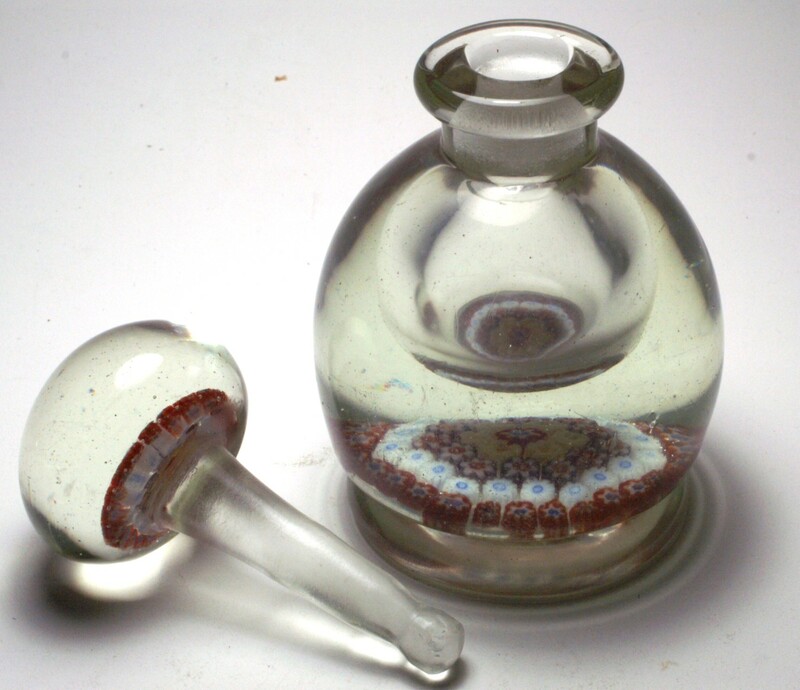 I would call this bottle a scent or perfume bottle because of the long stopper that reaches almost to the bottom of the well. 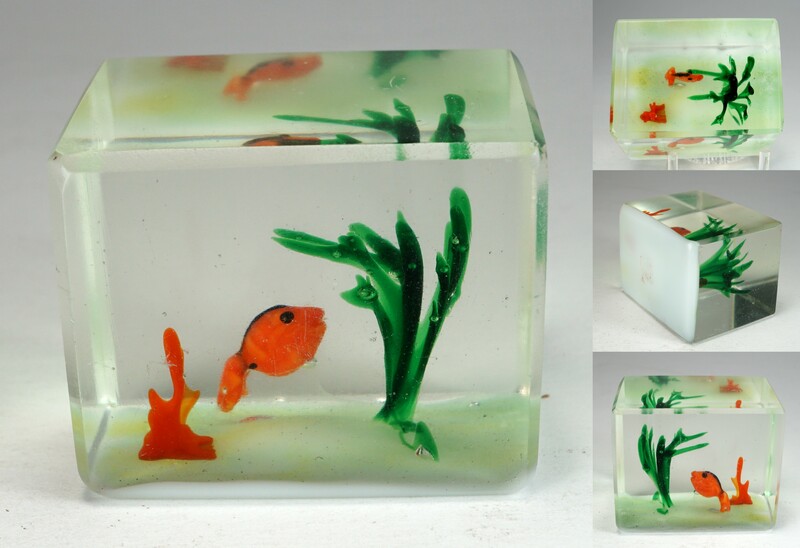 A very desirable Chinese paperweight collectible. 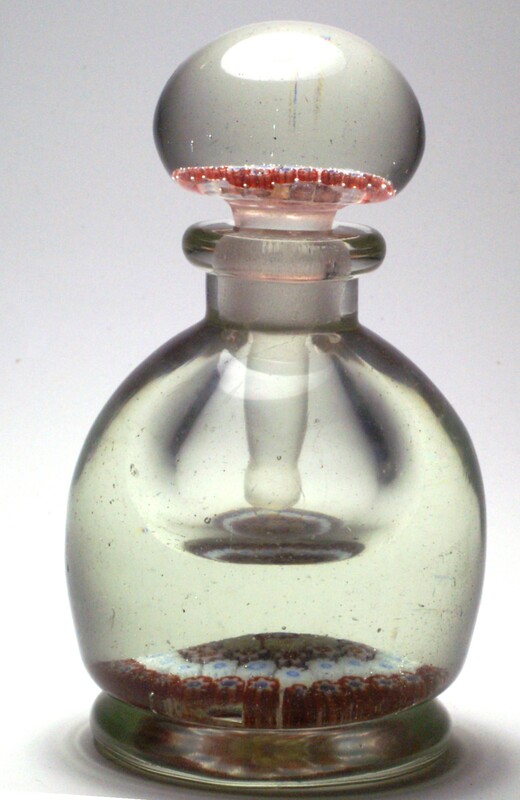 This is a copy of a Whitefriars inkwell from about 1920. You can see the Whitefriars version by clicking this link or by visiting the Whitefriars web page. Note the similarity right down to the footed base. Size: 3 1/8" diameter by 5 1/2" high. Excellent condition with only minor wear consistent with age. 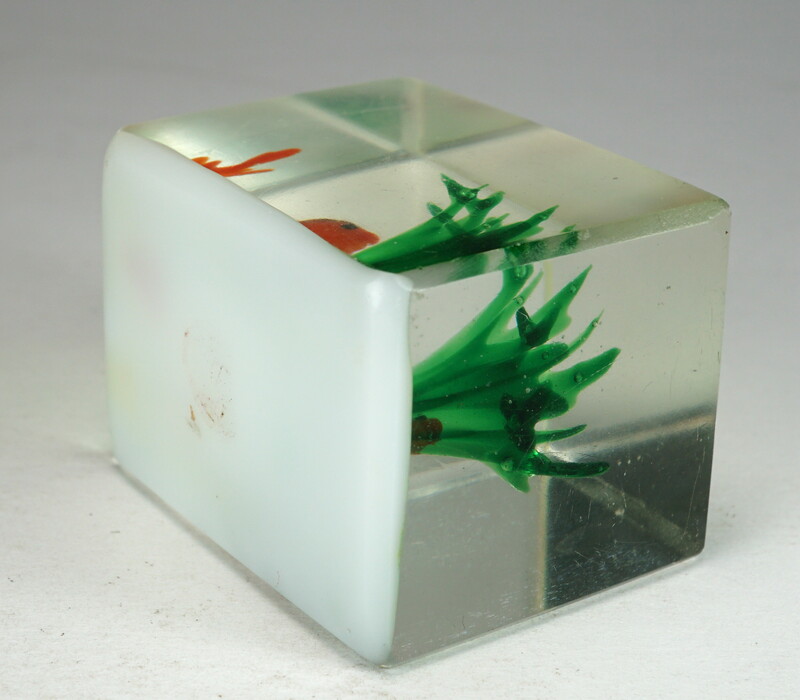 As is typical of Chinese paperweights from this period, there is some debris in the glass and it has a greenish hue. For comparable pricing, check lot 288 in Selman's Fall 2002 auction, in which a similar sized bottle brought $303 against an estimate of $275-$400. 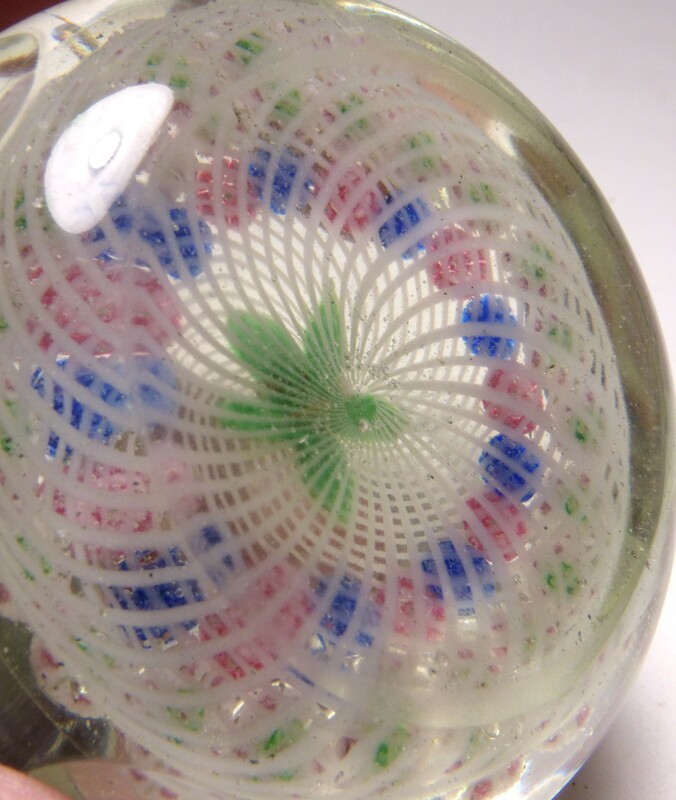 1247 Rare Chinese Copy of a NEGC Faceted Millefiori Nosegay Paperweight. circa 1930. 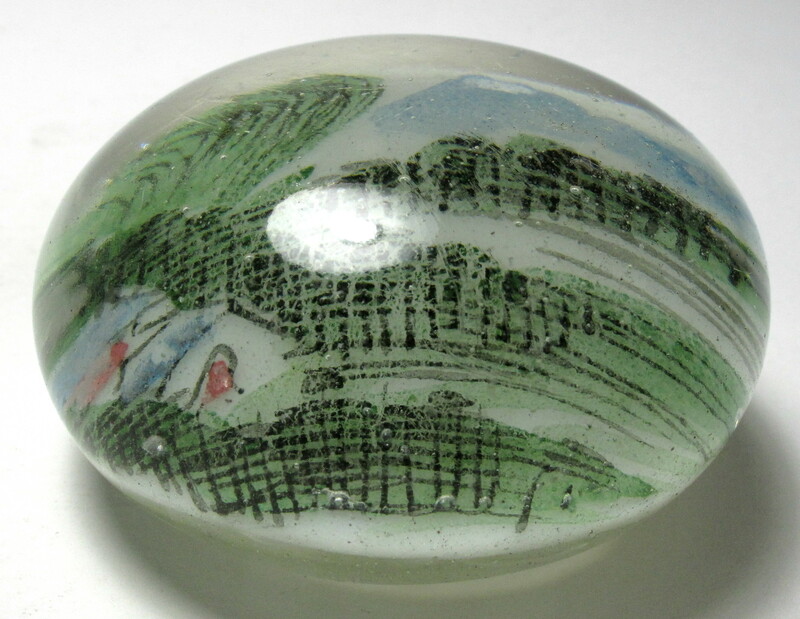 This is an almost antique Chinese copy of a New England Glass Company (NEGC) Posy Paperweight made circa 1860. It has the fancy NEGC quatrefoil faceting and setup. The millefiori nosegay consists of three red, white, and yellow complex millefiori canes with four green leaves and a stem. All this surrounded by two garlands of complex millefiori, one made up pink and blue flowers, the other made pink and white flowers with green centers. This great setup is on top of a latticinio swirl ground. There are twelve side facets (four large and eight smaller) plus the four part top facet with a notch between each. This particular example is unusually large and is in exceptional condition. 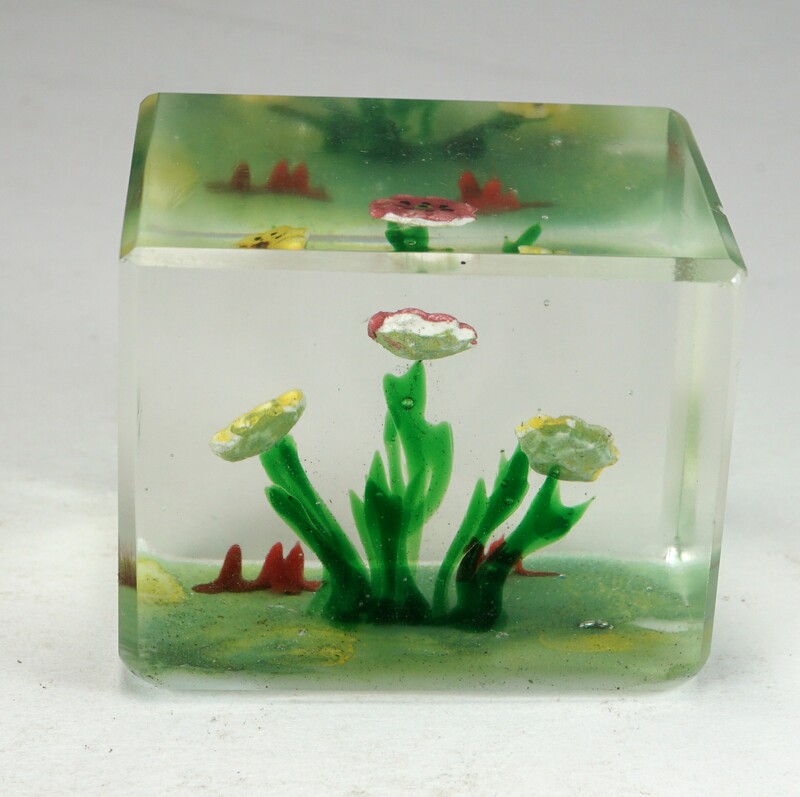 A fantastic addition to any collection of antique paperweights. In some ways, the execution of this example is better than the original NEGC, since NEGC examples usual have tipped or cracked canes and the posy is often smudged. Large Size: Just under 3" diameter by 2 1/8" high. The bottom is ground concave. Condition: Excellent condition. This is an unusually large example in exceptional condition. There is some debris or dirt in the glass as shown in the pictures. 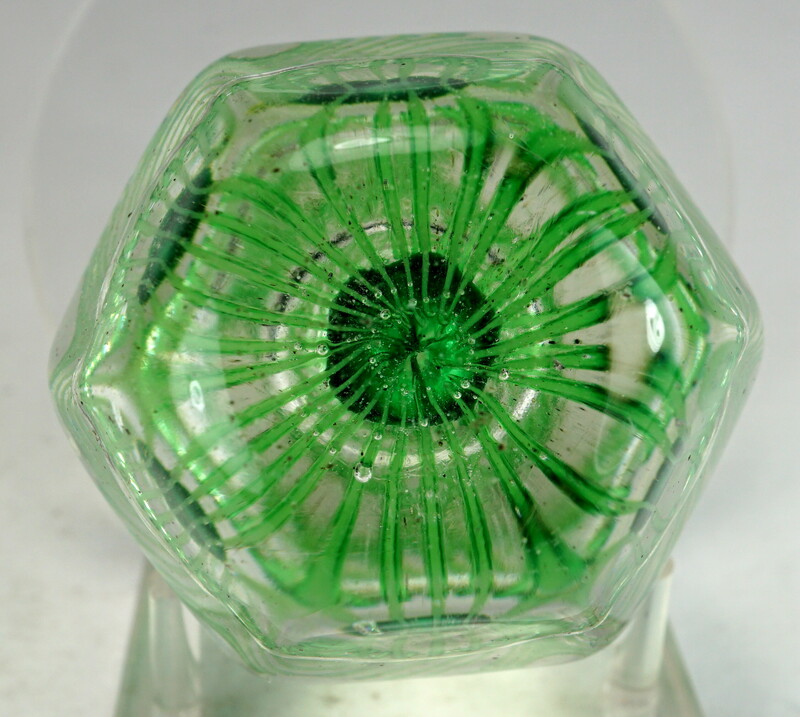 As with all Chinese paperweights from this period, this paperweight has a light weight glass mixture that is high in soda and has a greenish tinge. The glass has a soft almost oily feel.